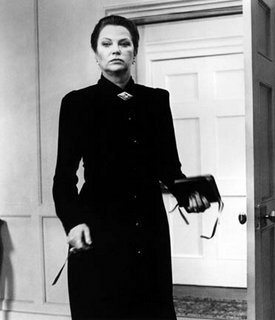 Many of my readers will know I live in the United States, but less will know that I am from Massachusetts. My state is a smaller, but important one on the East Coast, affectionately called “The Hub of the Universe” and the “Cradle of Liberty.” Besides being one of the first settlements of America, it can claim some amazing records, including being the birthplace of 4 presidents, the American Revolution, 121 of the best universities in the world including Harvard and MIT, some of the best hospitals on the globe, and the invention of basketball and volleyball. 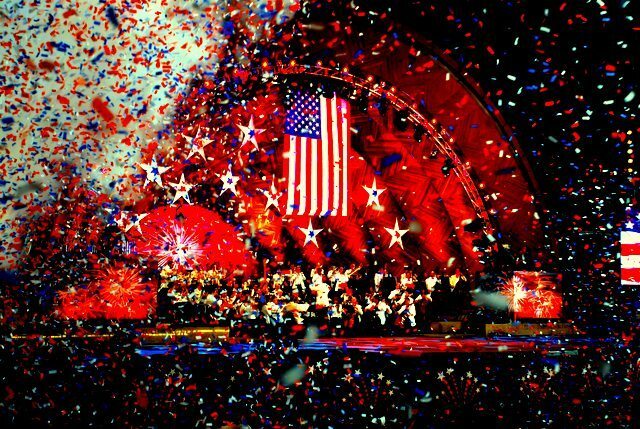 It is also home to the chocolate chip cookie, the first Thanksgiving, the first Christmas card, the first store Santa, and the first computer and incandescent bulb. In the automotive world, Massachusetts is the birthplace of vulcanized rubber, the first push button radio, the first fire truck, the largest federal highway project in the world called the Big Dig, and the only place in the world “where a boat can sail under a train, driving under a car, driving under an airplane.” More importantly, it can claim a place in the birth of the automobile itself, being the home to Charles and Frank Duryea, the first Americans to build a successful commercial automobile and the first to incorporate an American business for the expressed purpose of building automobiles for sale to the public. I live in a city called Taunton, and had no idea it had any connection to the automobile. 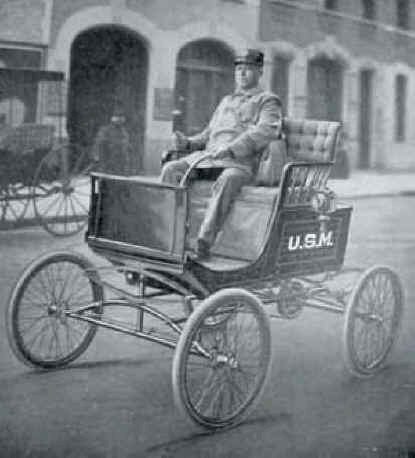 In fact, the Taunton Motor Carriage Company built steam cars here from 1901 to 1904. About 2 miles from my home is a town called Easton MA. In a section called South Easton there were no less than two companies building cars at the turn of the century. The Eclipse Automobile Company and the Easton Machine Company built runabouts and modern style cars called the Morse respectively. Easton is also known for the Ames Shovel Company, manufacturer of the shovels that opened the west. In my hometown of Brockton, manufacturers included the Marsh Motor Carriage Company, creating steam cars from 1899 to 1905 before quitting the auto business to focus on making motorcycles. Marsh Motorcycles eventually became the American Car Company and went on to create unique air-cooled runabout cars. The Cameron Car Company built cars in Brockton from 1906 to 1907, and the Pickard Brothers built expensive touring cars there from 1908 to 1912. 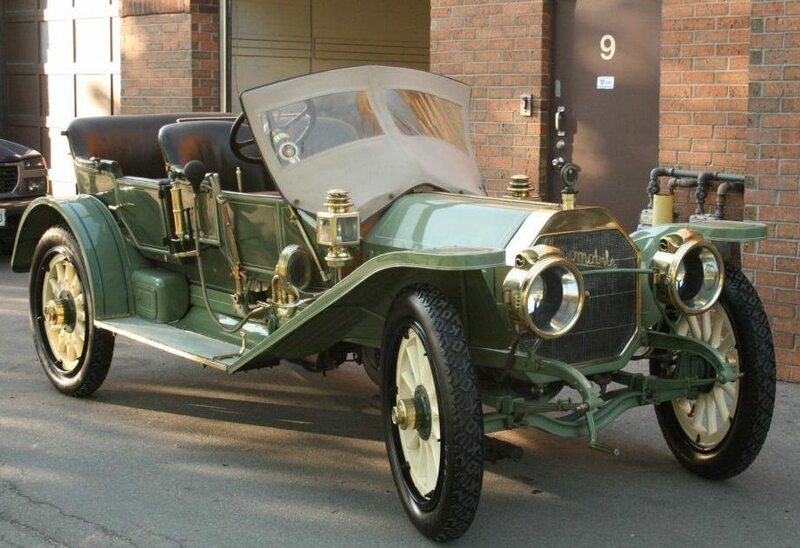 Finally, the Roader Car Company produced fast little runabouts from 1911 to 1912 about a half-mile from my house. Brockton is also the home of fighters Rocky Marciano and Marvin Hagler, as well as being the first place in the world to have an underground electrical system, installed by Thomas Edison. 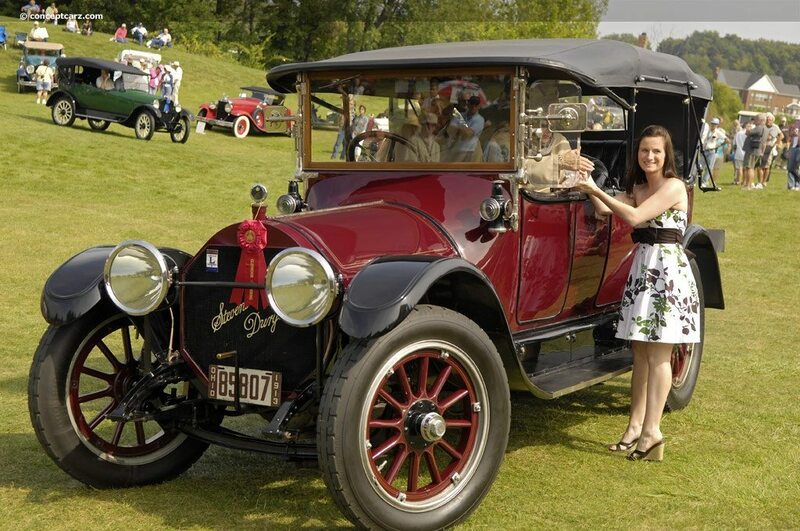 Other Massachusetts car companies include the Stanley Motor Carriage Co of Newton Ma, who created a popular line of steam cars and racers. 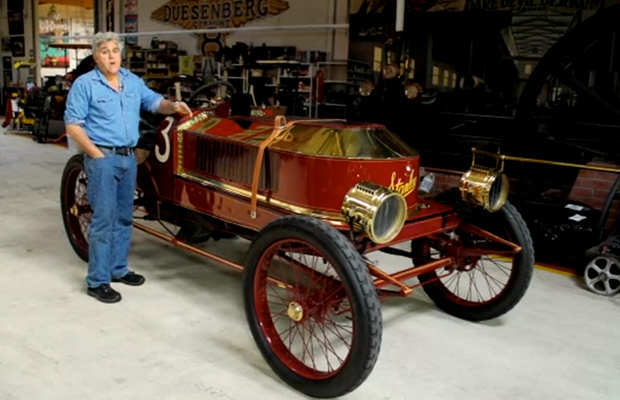 Jay Leno owns a few running examples. 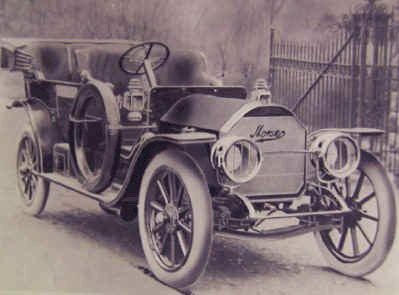 Locomobile, a company that built large touring cars had a plant in Watertown MA, before moving manufacturing to nearby Connecticut. The English car company Napier also had a plant in Massachusetts, located in Jamaica Plain. 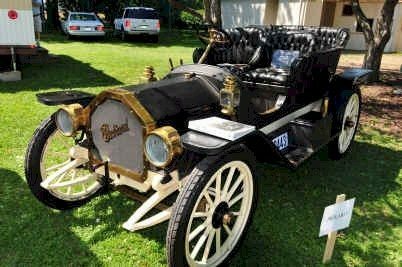 Napier of America originally imported cars from the UK, but eventually built the complete cars in the US until 1912. Two of the most important contributions to the automobile occurred in the western part of the state. In Springfield, the Duryea Motor Wagon Company was the first American company to build gasoline automobiles. 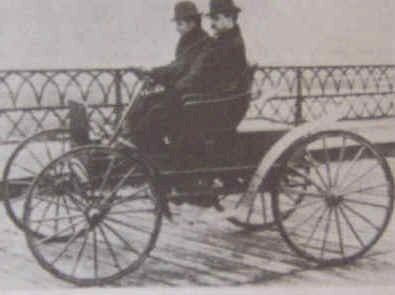 Founded by brothers Charles and Frank Duryea, they demonstrated their first “Ladies Phaeton” on September 21, 1893. 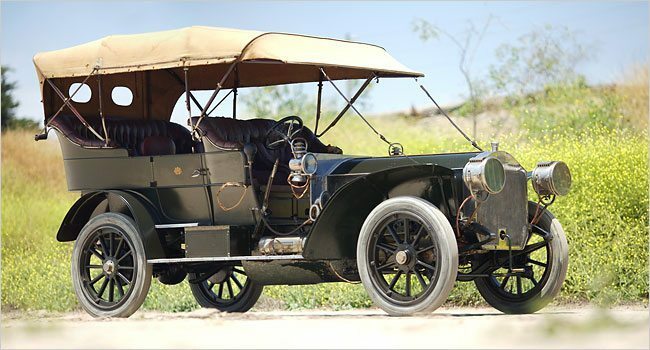 This car also is heralded as the first successful gas-engine vehicle built in the United States. The brothers went on the create the Stevens-Duryea Company which build cars from 1902 to 1928, and then the Hampden Automobile and Launch Company. Also in Springfield was the Hendee Manufacturing Company which made the famous Indian cars and motorcycles. 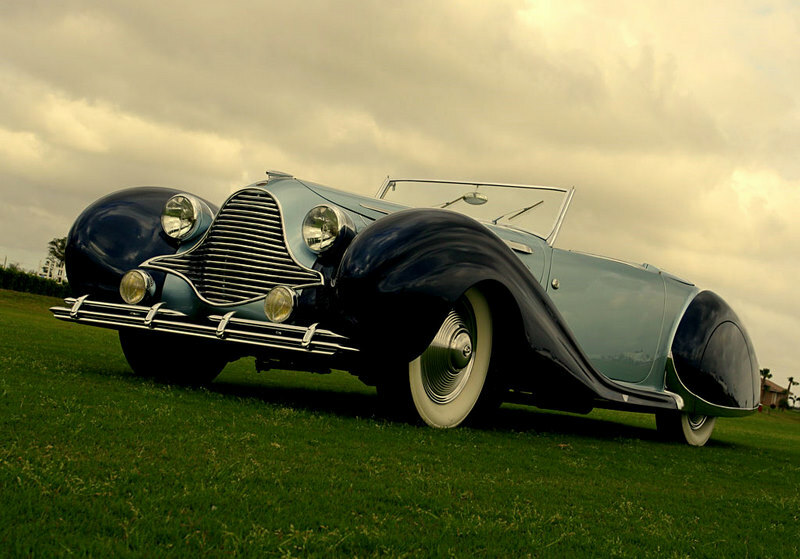 Hendee was later purchased by Paul DuPont, who built a line of luxurious DuPont cars. The most well known venture is Rolls-Royce of America. From 1920 to 1930 the company produced over 3000 Silver Ghost and Phantom models, many of which are considered icons of the era. Springfield is the only place outside of Great Britain where Rolls-Royce cars have ever been manufactured. The automobile business in Massachusetts lives on to this day. In Wareham, a town about 10 miles from my home, there is a company called Factory Five Racing that re-creates some of the most iconic American cars ever made. 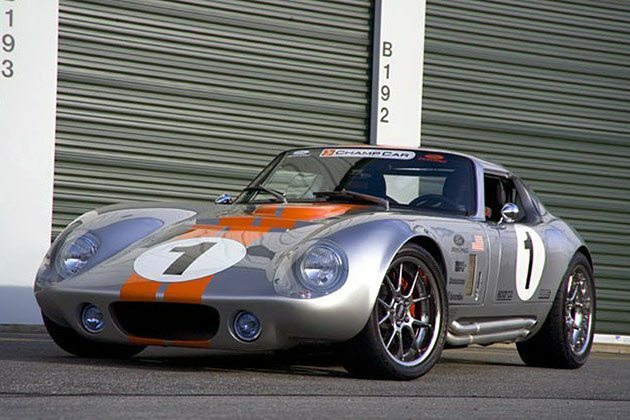 From 1930’s hot rods, to the most popular recreation of the Shelby Cobra and Cobra Coupe, the company is the ultimate producer of the modern kit car. 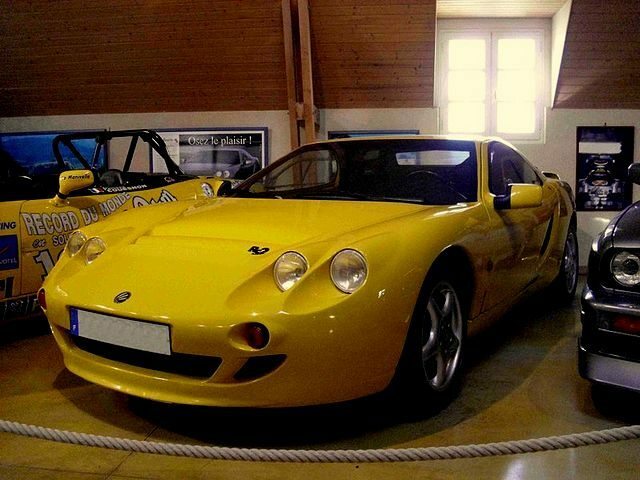 In addition, the company produces finished versions of the GTM supercar, a vehicle that can do 0-60 in about three seconds and is faster than a Ferrari 599 Fiorano. 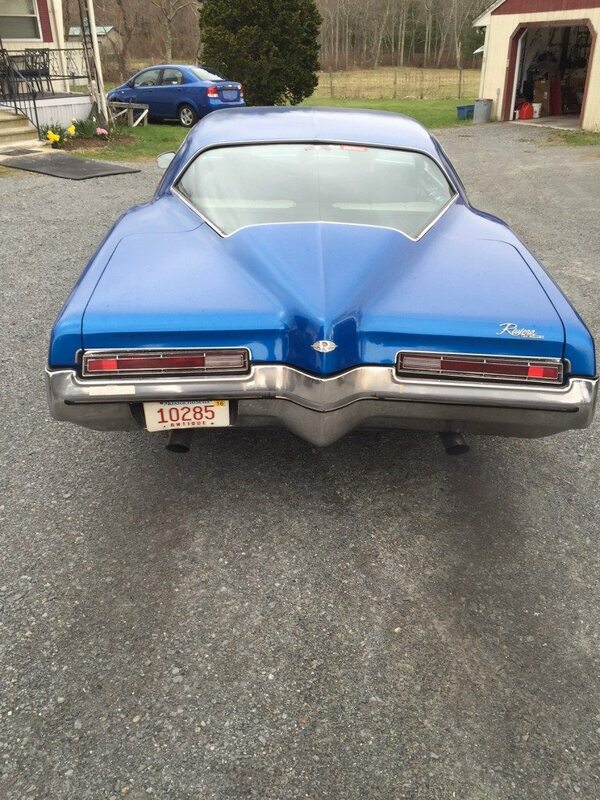 Massachusetts has an important place in automotive history. This history includes an impressive list of automobile manufacturers as well as a major role in the birth of the American car. Massachusetts is home to great coachbuilders like Waterhouse of Webster MA, builders of fine Packard bodies, and the old Framingham GM plant, builder of the iconic Pontiac GTO. Massachusetts has been in the automotive business from 1792, when the Hand Pump Wagon was built at the Boston foundry of Paul Revere right up to present day, with the GTM supercar by Factory Five. It remains an important contributor to the evolution of the automobile. Halloween may be gone, but it has left me with four pounds of stale Butterfingers and this article. 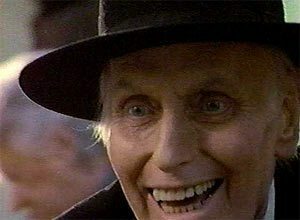 In the spirit of all things macabre, I decided to make a list of the perfect villain cars. Whether you are a local scoundrel with a taste for whiskey and bad behavior, a big time hood looking to break legs for your boss, or some evil super villain with a pool of ill-tempered sea bass with frickin’ laser beams attached to their frickin’ heads…you need the perfect ride. Cruella DeVille in a Volkswagen Beetle or Hannibal Lecter in a Fiat 500 would look ridiculous, so having the right ride is as important as a personal torture chamber. This car looks like Bruce, the shark with its huge toothy grin. The only family this car would be perfect for is the Addams family. 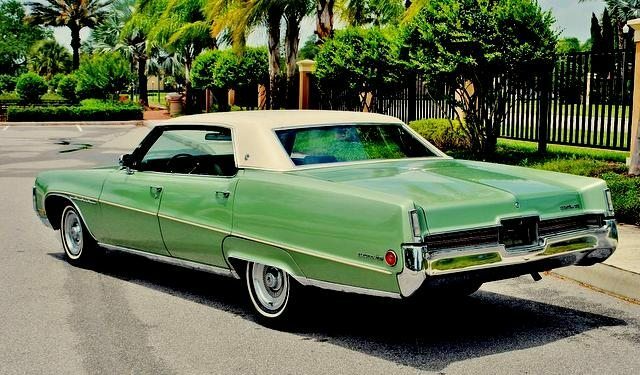 It looks pissed, and I think it would have been a better choice for the movie “Christine.” It would be the perfect car for the local hood with anger issues and a penchant for digging up bodies. I had a tough time with this one. 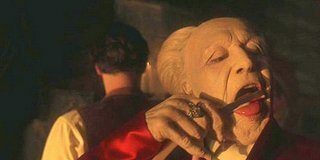 I should go to an evil Jay Gatsby type, or modern vampire. 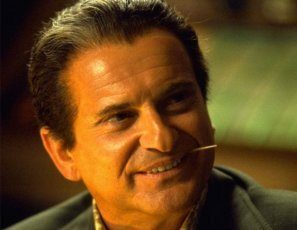 In the end I chose Sean Penn for his portrayal as Mickey Cohen. 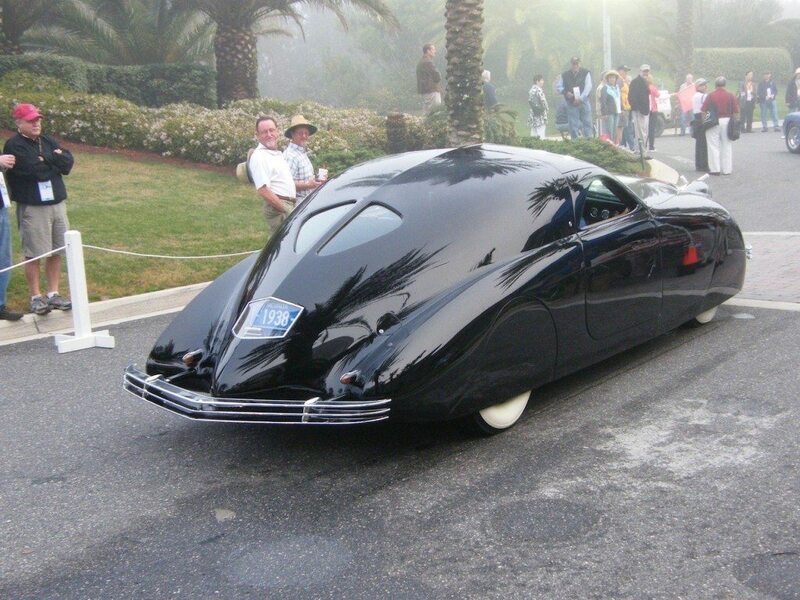 I figured it would be a great car for a mobster, and considering the nose on this was actually called a “coffin nose,” it would keep up the evil image. This is an easy one, since this car was actually in the movie “Casino.” It would be the perfect car for Joe Pesci, Robert DiNero or Ray Liotta. 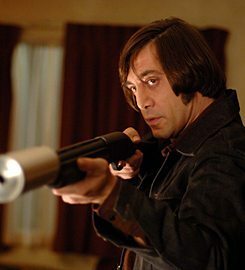 In fact, it would be a great car for anyone who wants to appear dangerous. 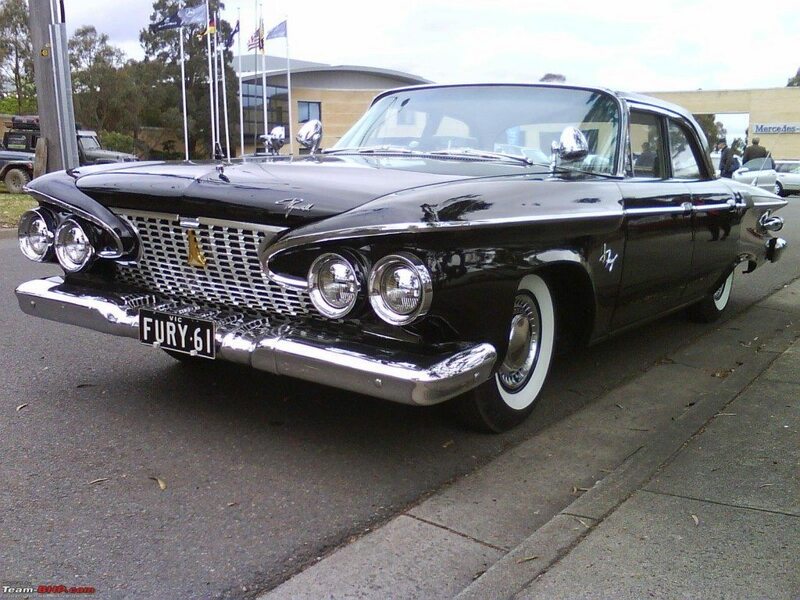 The size of this car in real life is huge, and the hideaway headlights and egg-crate grill look very menacing. This is truly the most evil of all cars. 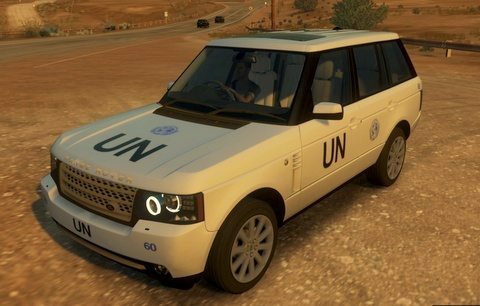 Jeremy Clarkson of “Top Gear UK” said that “Owners of this car almost always have access to an air force.” In fact, real life owners of this car include some of the most evil dictators the world has known, as well as the Pope and a couple of Beatles. 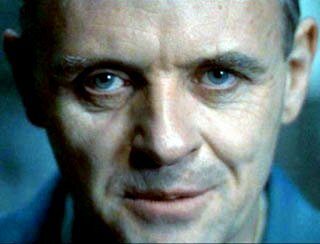 Since there was always a European flavor to Dr. Lecter, I thought this would fit his lifestyle perfectly. Gru needed a comic looking evil car, and the closest thing was this Phantom Corsair. Even the name sounds spectral, and it looks like it would be equally at home on the road as it would in the sky. Originally intended as a six passenger, it is estimated to hold about 43 minions not including ray guns. This is more than just a classic; this is a work of art. 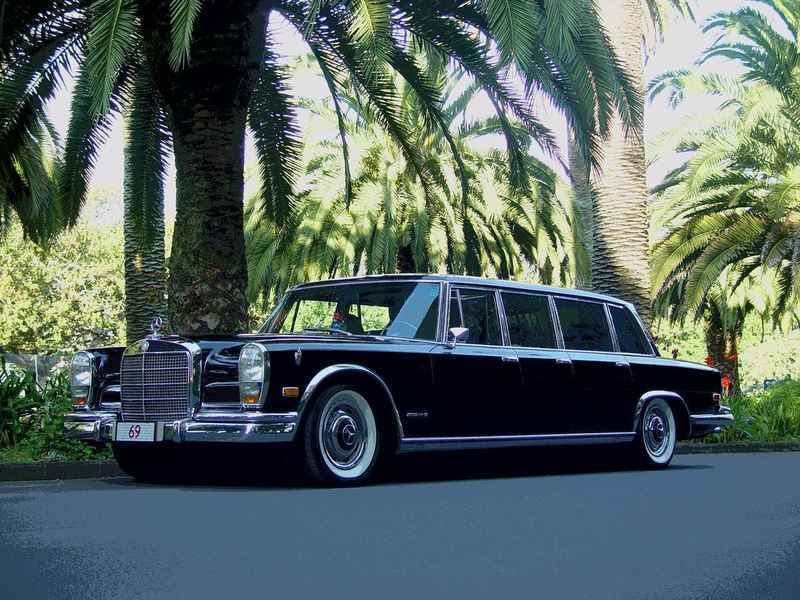 It was the last Mercedes designed by Ferdinand Porsche, and build specifically for Didi, as the Count was known. 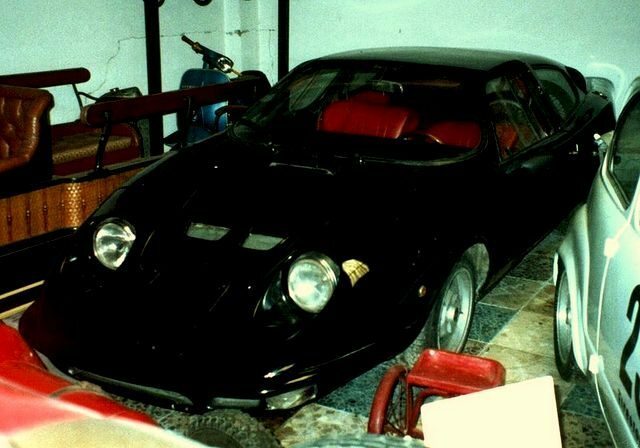 Trossi was the former president of Scuderia Ferrari, and loved this car so much that he bought, sold and repurchased it several times though out his life. 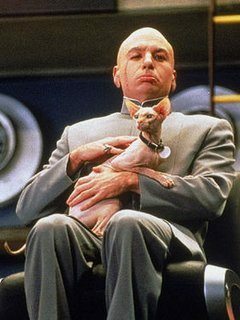 Presently, it is owned by the evil super-villain, Ralph Lauren. This is the car that every true evil villain should aspire to, and I thought it was fitting for Ms. DeVil what with her Luciferous name. The Bucciali is the perfect cartoon/movie baddie car, with its low brow and hulking wheel arches. The touches of red trim along the beltline and wheels looks like dried blood, and the winged swan looks a little like a fallen angel. Less than a handful of these cars survive, including one which sported two (2) Continental straight eights mounted side by side. 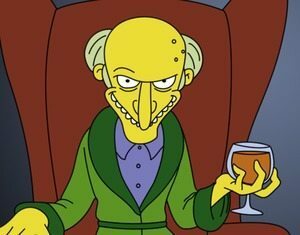 Evil personified. 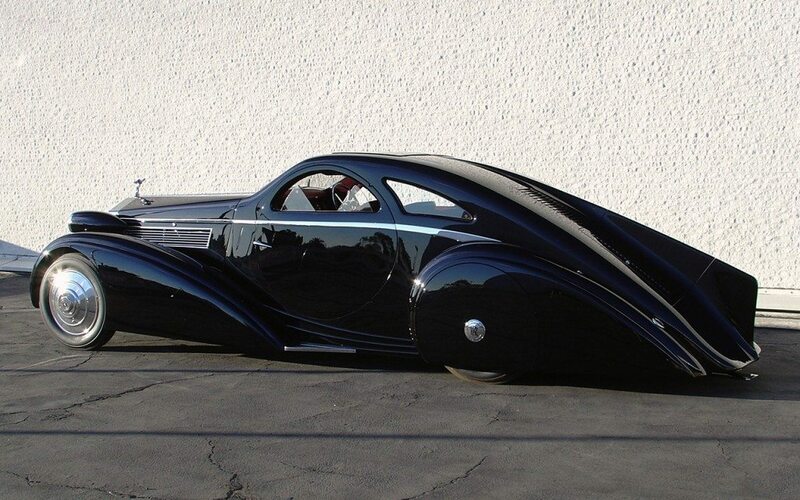 The number one most evil car on our list is this custom bodied Rolls-Royce. It is the only one known to exist. 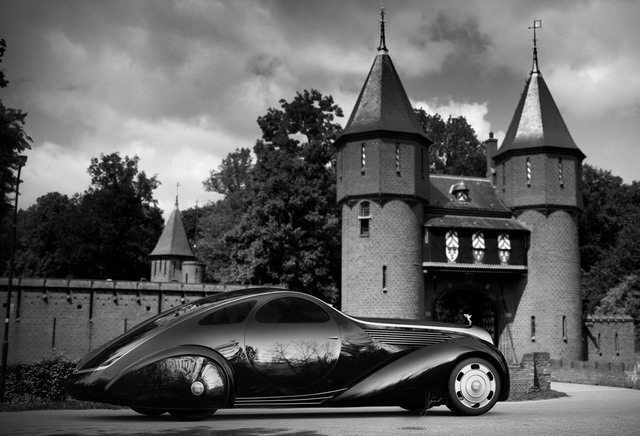 The car was re-bodied by Jonckheere of Belgium almost 10 years after production into this masterpiece. 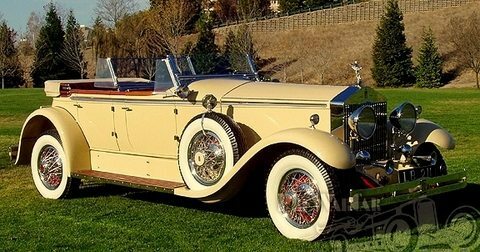 Though the car is almost 90 years old, the lack of bumpers and the low sweeping lines makes it as modern looking as a new Phantom. The highlight is the round “porthole” doors and the long center fin. 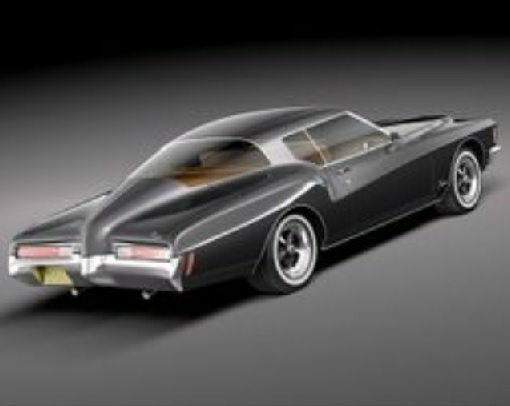 If I were a super-villain, vampire, or world class evil-doer, this would be the car for me. As a note, I would love to hear your suggestions on evil looking cars, or who would be the better match to the cars on this list. Contact me through comments, via email (listed on about page) or though Twitter and Facebook. Photos Courtesy of Google images, Wikipedia, boldride.com and Flikr. With the coming of the New Year there is an excitement about what the future holds. 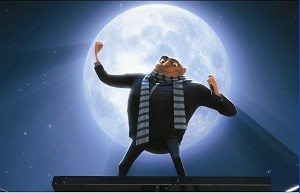 Two events inspired me to write today’s article. The first was a book called “Concept Cars” that I had received as a gift from my sister. The second was being caught behind a slow moving Mazda 5 mini-van on the way to a lunch appointment. The book is written by John Stroud, and is a coffee table style photo book. 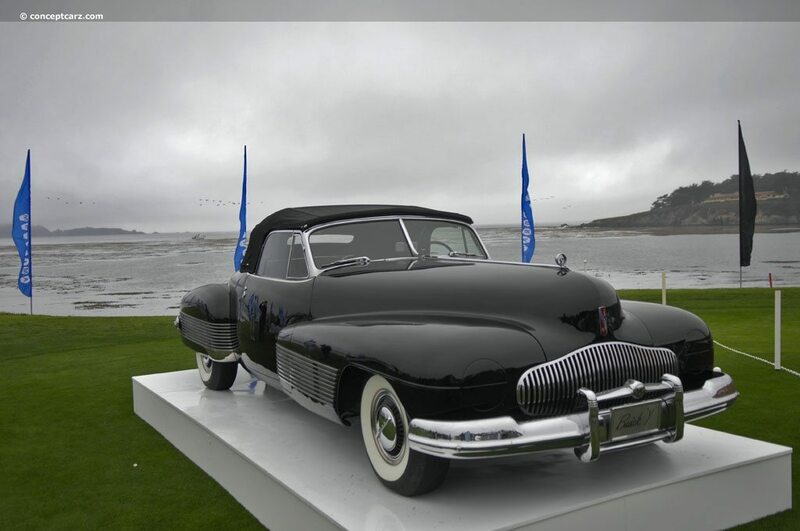 It covers concept cars starting with Harley Earl and the 1938 Buick Y Job and follows through up to present day. Of all the car books I have received, this one is probably the best. One car that stood out to me was the Mazda Hakaze. Besides being futuristic, it has a scallop effect along the lower wings that is utterly beautiful. It made me wonder why styling cues like that never make it into production cars. Later in the day, while sitting behind that Mazda minivan in traffic, I noticed something interesting. Though much more subdued, the same scallop effect was on the side of the van. Somehow the styling of the concept had made its way to the sides of a boring little minivan. 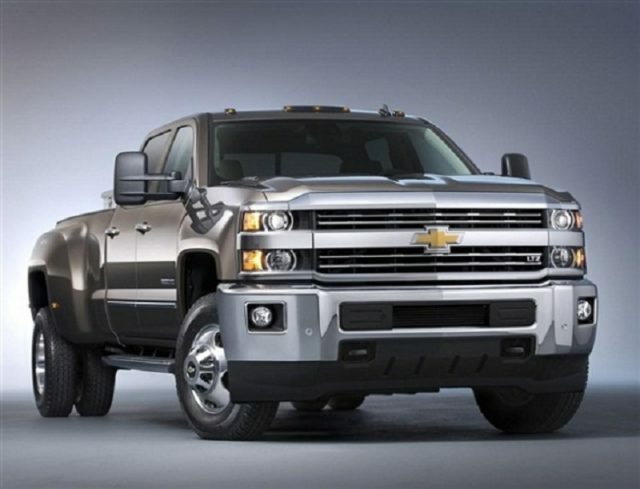 It got me thinking…how many other concept designs are slowly creeping into the mass market? To answer that question, all I had to do was see the new Cadillac ELR. 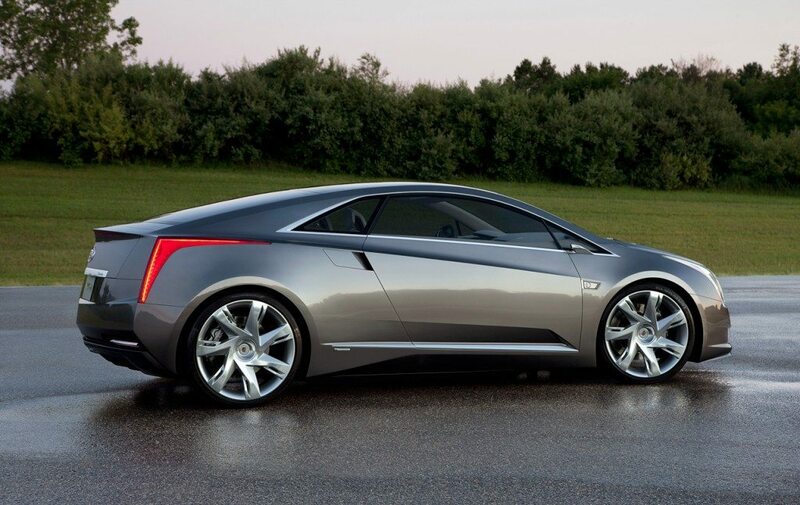 The ELR was the darling of the NY auto show, and is about as close to a concept as you can get. 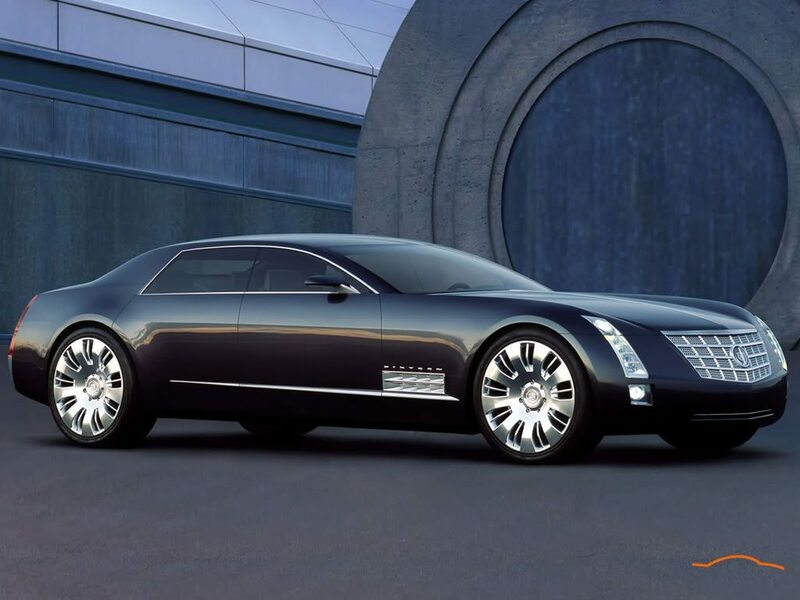 It is loosely based on the Cadillac Cien concept, and exaggerates the lines already held standard by cars like the CTS and XTS. It is cutting edge, sharper than the others, and looks stunning. Cadillac has really taken the idea of developing concepts into drivable production vehicles. It is astounding that same company that brought us the tail fin and the Dagmar bumpers can be this cutting edge, but also reassuring that Cadillac, with its history of daring design still has what it takes to create something unique and beautiful. Cadillac is far from dead. 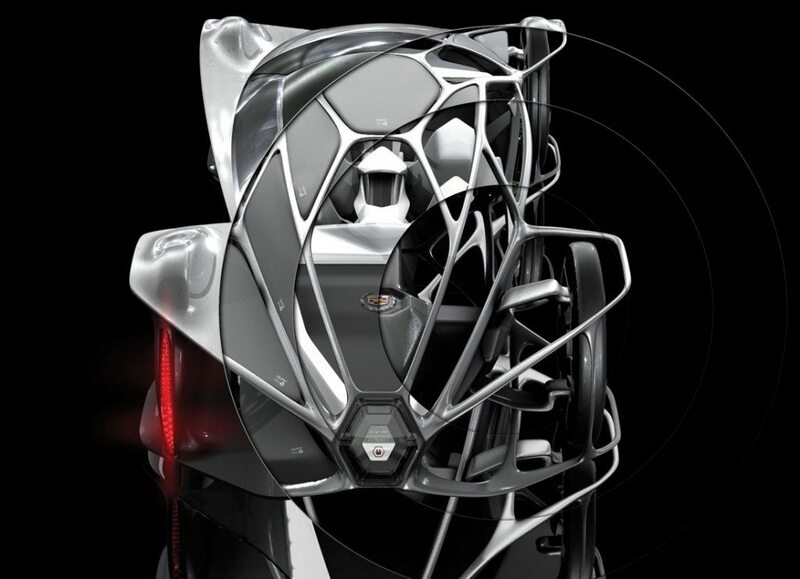 This fully functional concept car of the future is named after the Milanese word for Fog. The hood is styled after the shield on the grille, and the rear area is a 2-piece glass unit designed to show off the engine bay. Gull wing doors and a unique headlight treatment accent beautiful lines that can only belong on an Alfa. 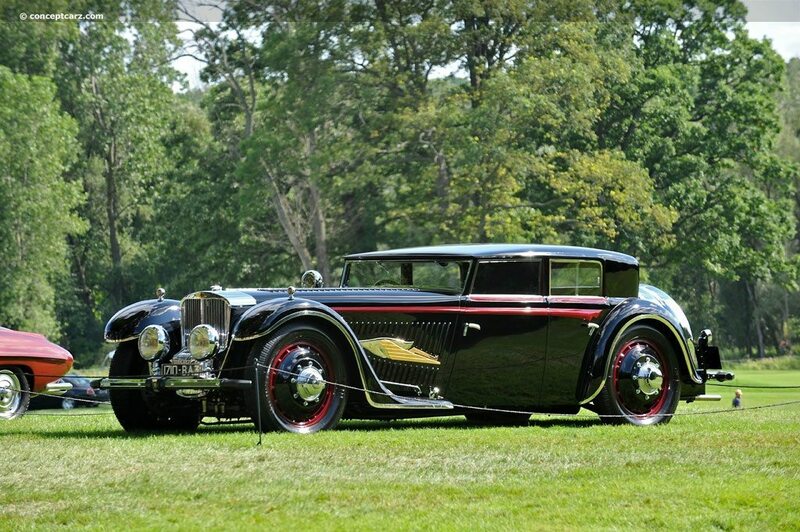 The Cadillac Sixteen was astonishing when it was first introduced. 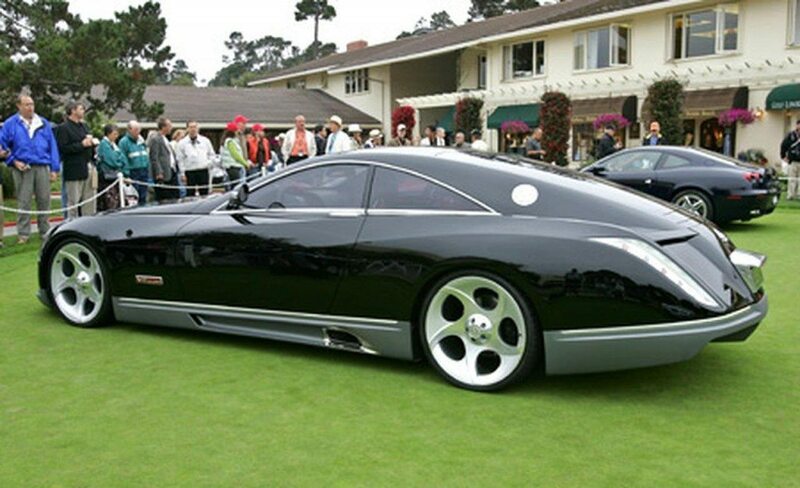 It sports a V16 engine with 1,000 horsepower and harkens back to the Cadillac’s of the 1930’s. The car features a power operated dual hood opening, hinged at the center spine, as well as an all glass roof. Originally created as a one-off design for American collector James Glickenhaus, it is said that three examples will be built by an American company. 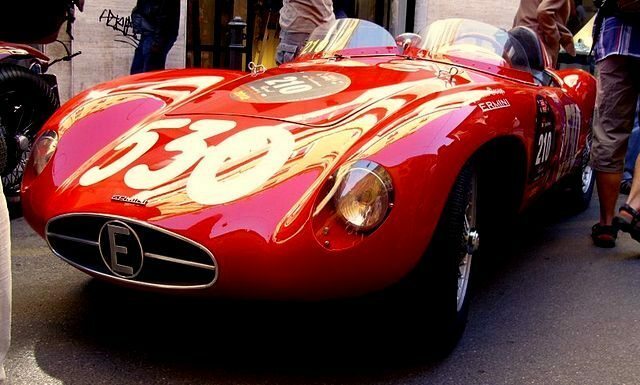 Based on the Ferrari 330 P3/4 race car, it reportedly cost $4 million USD to build. Considering he has already received an offer of $40 million from a member of the Saudi royal family, it seems like a good deal. 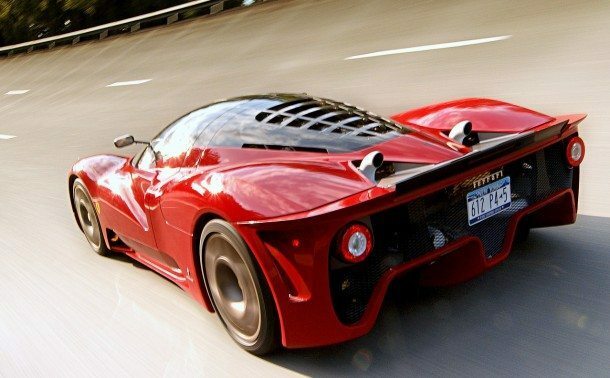 Glickenhaus is already planning a successor to this car, called the P33. 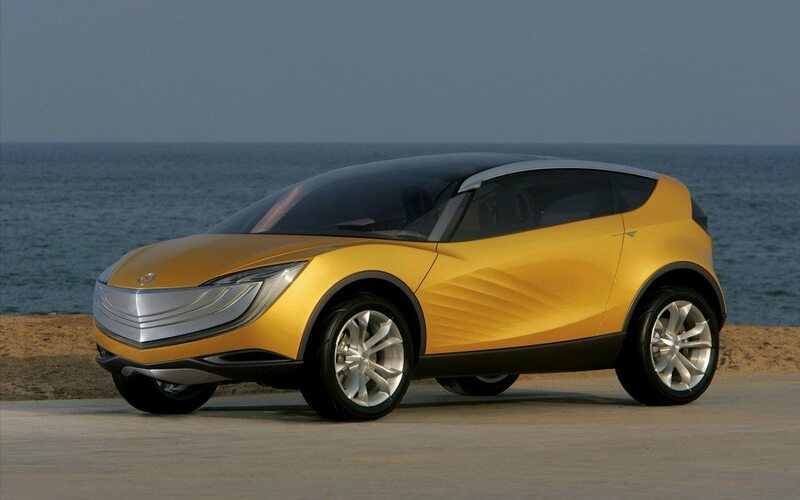 Introduced in 2006, the Nagare is an exercise in natural and organic car design. The name Nagare means “flow” and was the predecessor of the Hakaze concept car. Besides the fluid seamless form of the body, the car features two double-length doors that open forward and spread from the cabin like the wings of a butterfly. 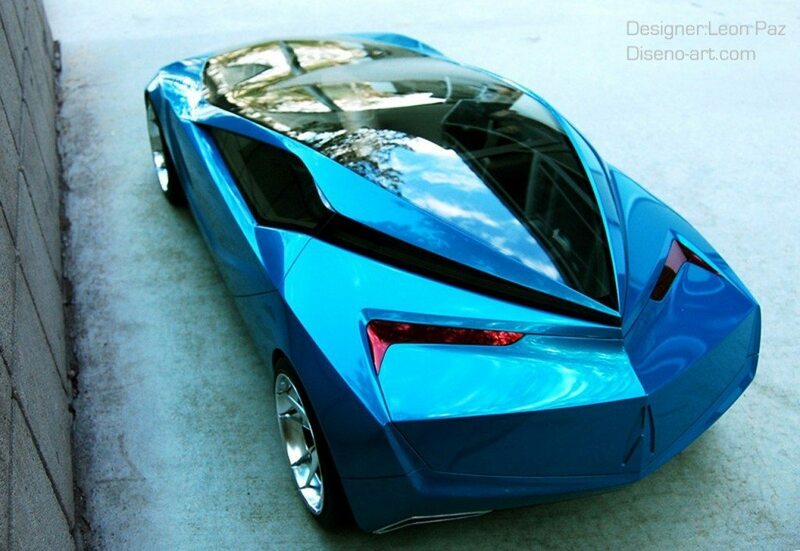 This concept car sports a multi-faceted design language described as “modern baroque-fashion” and was intended on being a gateway car for the new NSX. The car features a glass roof, see-through engine bay, as well as a “predator” styled rear end. Built using a new family of plastics designed to be better and stronger than fiberglass, it is a collection of cool and frightening ideas. The hood is sealed, and cannot be opened by the owner. It is scheduled to have a single yearly maintenance visit, which will include servicing the engine (protected with nanoil, or nanosized beads) as well as replacing the interior fabric with something more fashionable. Weird, but I still want one. 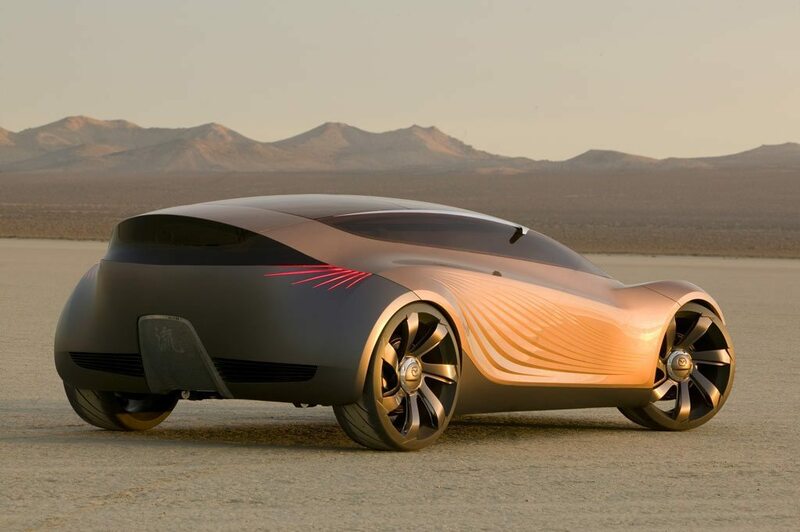 Winner of the 2010 LA Design Challenge, this “Batmobile” is the strangest car on our list. Basically, it is Cadillac’s version of the Ariel Atom on steroids. The frame uses a 3-D lattice mono-formed design found in the grouping of bubbles in nature and is essentially “grown” into a single part lattice structure. It uses compressed air to serve as an engine, and the same pressurized air cells found in the airbags of the NASA Mars Rover. Batman should drive this car. 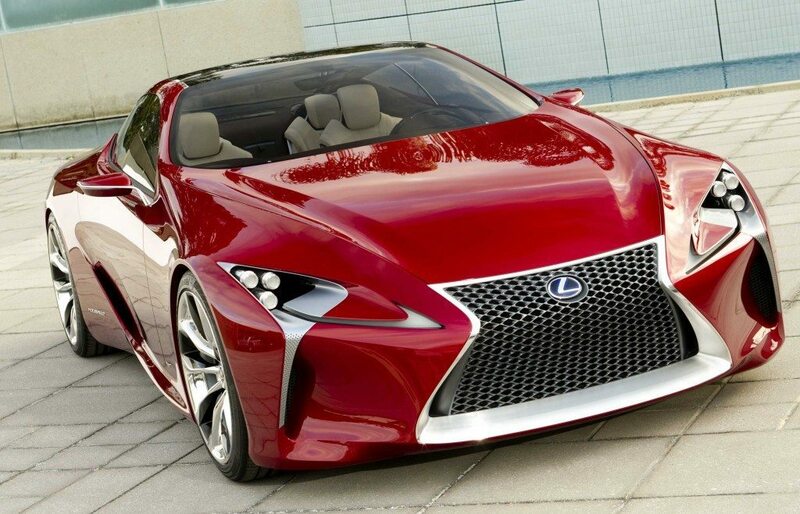 Lexus is the company that brought us the “Worst Car Ever Made,” the SC 430. To make up for it, they also created the LF, probably one of the best hypercars ever made. The LF was a gizmo laden space ship capable of amazing speed and the absolute best sound ever produced by an exhaust system. 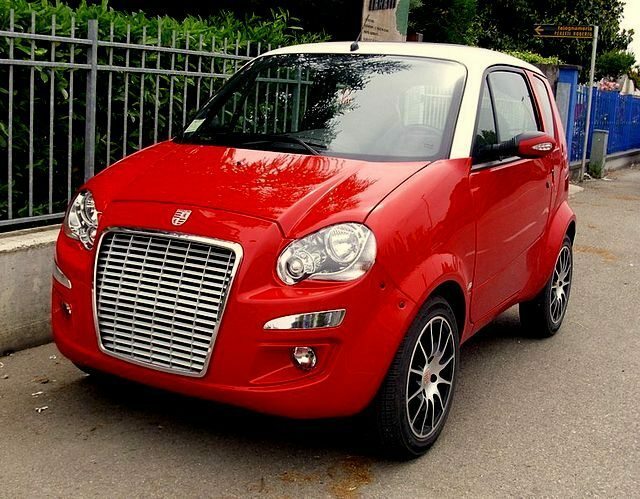 Styling was never its strong suit, looking more like a villain from “Mighty Morphing Power Rangers” than a car. Now the new version is straight from the aliens of “Independence Day.” The new spindle grille is awesome, and the intricate flowing form is almost alien. The inspiration was the leaf of a tree, and the result is just mind blowing. 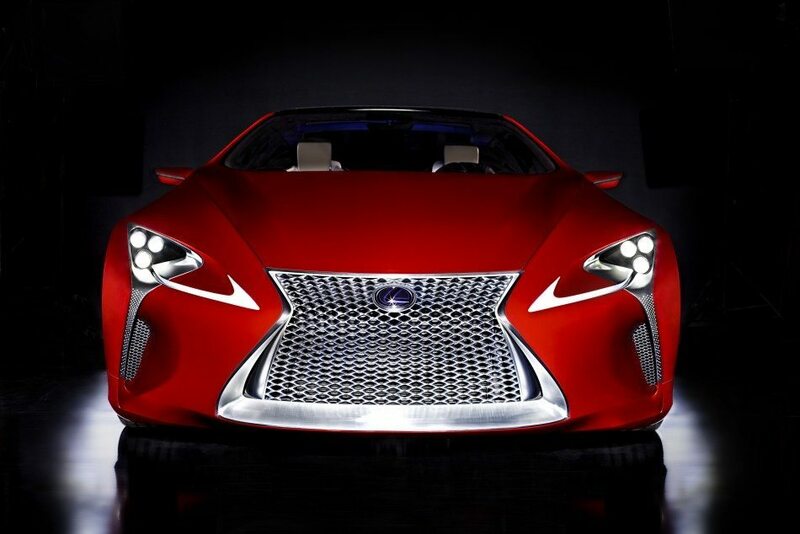 The same group created the LF NF concept, a hyper-SUV that is as stunning as it is strange. 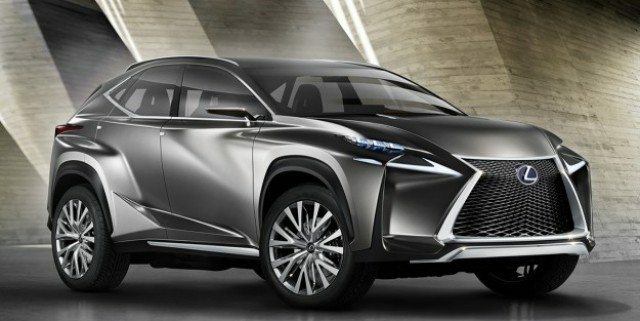 This is what a car should be, and what every designer wants to create. 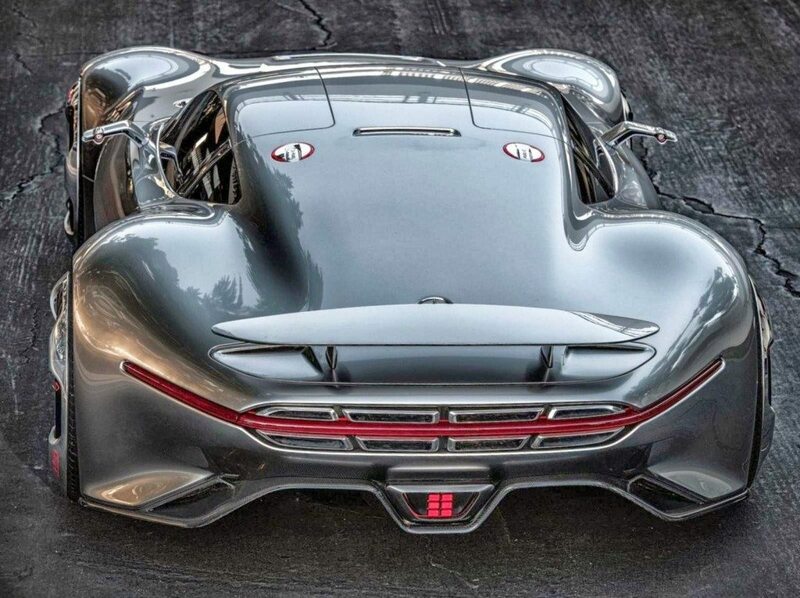 Stunning from every angle, this 1,000 horsepower monster was originally designed for the video game Grand Turismo 6. It became a real-life concept for the Los Angeles International Auto show, and left the crowd and auto pundits breathless. 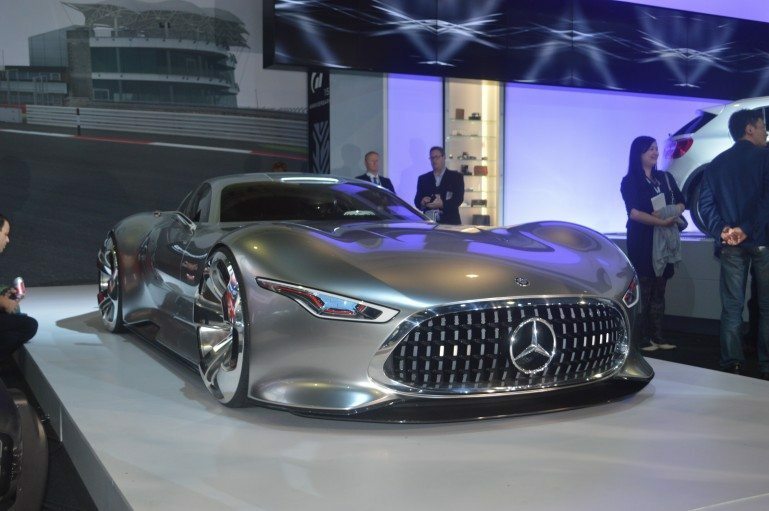 The Vision recalls the Mercedes-Benz Silver Arrow race cars of the 1930’s with a grill like the 1952 300SL race car. That grille is one of the best parts, and should be on every car made. It sports individual LED lights that can create shapes and effects. Gull wing doors, full steel wheel covers, no rear windows, and a tail section composed of 7 exhaust pipes makes this the coolest car since the Citroen GT concept. 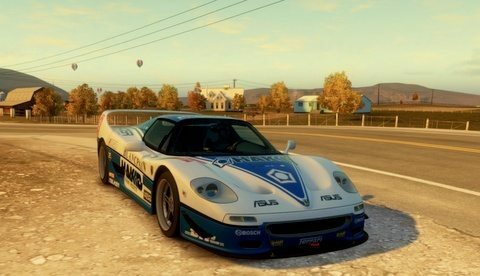 Why can’t we have cars like this in real life? It’s Hard to Improve on Perfection but Ford Just Did It – Again! Year after year Ford’s F Series Trucks have been one of America’s bestselling trucks and again this year, the 2017 Ford F250 Super Duty XL tops the charts. 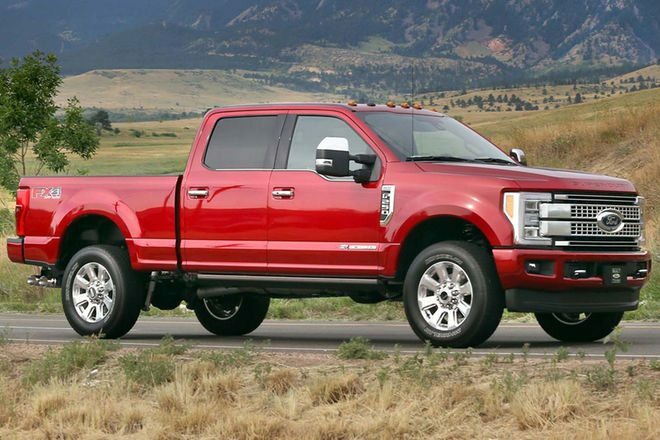 The F-Series has always been considered to be the perfect truck in both function and style, and again this year, Ford shows that it really is possible to improve on perfection. They’ve done it again! Most vehicles don’t even make it a decade before they are discontinued and rendered obsolete. For this reason, the fact that Ford’s F-Series trucks have lasted an amazing four decades on the market, since January of 1948, is one for the history books. 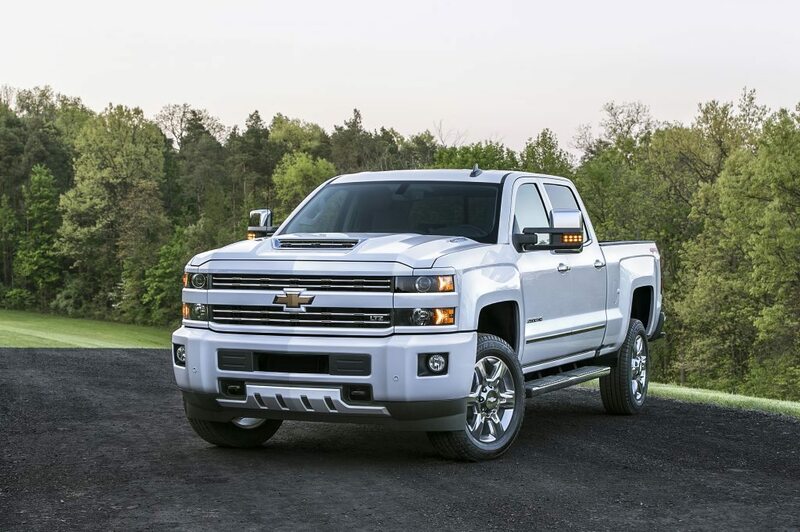 In fact, not only has the F-Series been one of the longest running series ever but for the entire time, this amazingly versatile truck has been a chart topper. Once you’ve had a chance to see and drive the all-new 2017 Ford F250 you’ll see that the improvements are what keeps this model at the top of the industry. 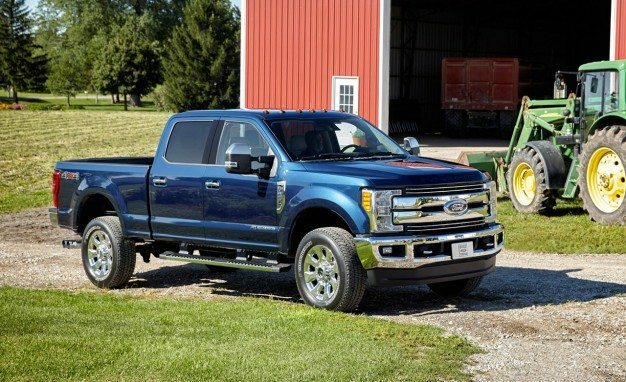 If the F-Series trucks are considered to be the iconic workhorse of pickup trucks, then the 2017 F250 Super Duty is the holder of the blue ribbon. 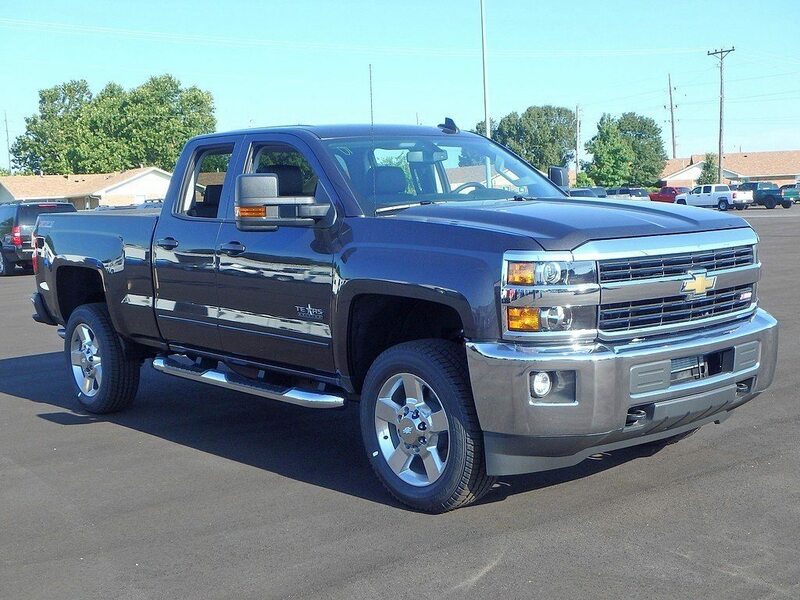 This is the truck that can withstand the rigors of literally any job and as for maneuverability, it has it over all other trucks of its category from literally any manufacturer around the globe. 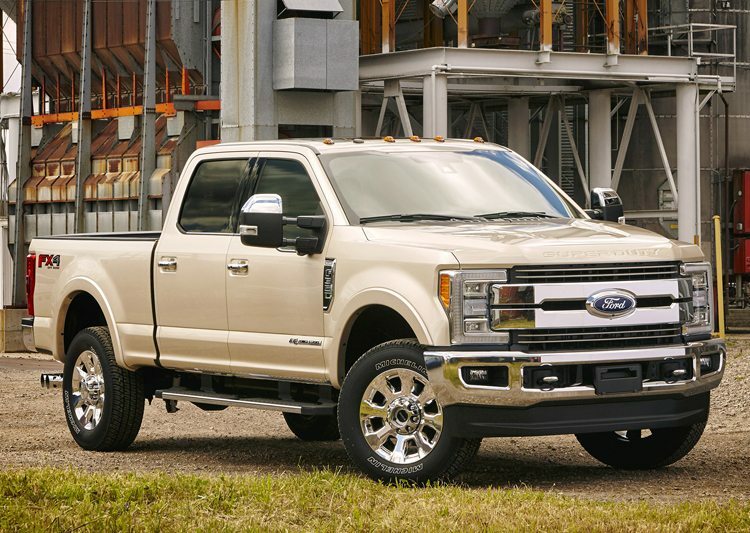 In fact, without mentioning names, the other truck put out by Ford’s leading competition in the U.S.A. is said to be ‘okay’ but lacks the maneuverability that is so well-loved in the F-Series trucks. In keeping with the times, Ford has installed just enough technology to satisfy even the techiest of car lovers looking for a truck that will haul a load but will also offer a system that shows a graphic display when backing in reverse, guidelines to indicate steering and an 8 inch screen upon which to watch while maneuvering into tight parking spaces so that it can be done quickly and efficiently without endless goes at fitting a trailer into a tight spot. The 2017 Ford F250 also has an overlay on the graphic of the steering wheel so that arrows show where you are backing up and which direction you need to turn those wheels. It’s the next best thing to a fully autonomous vehicle and that, alone, is a compelling reason to keep this truck at the head of the class. Ford, being the epitome of American made vehicles, has done it yet again. 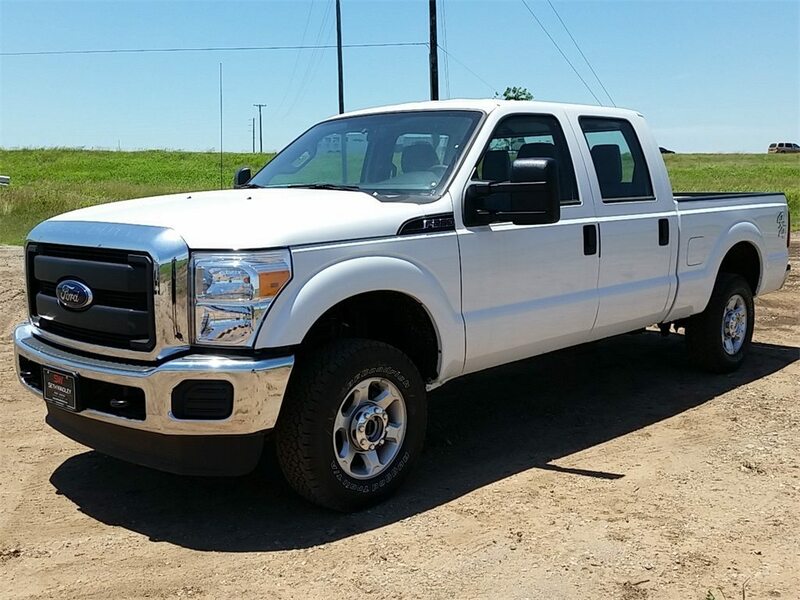 There are so many features on this one Super Duty truck to make it worth taking the time to take a test drive. The F-Series trucks just keep getting better by the year as features that were great last year are kept while new, improved features are added year-after-year. 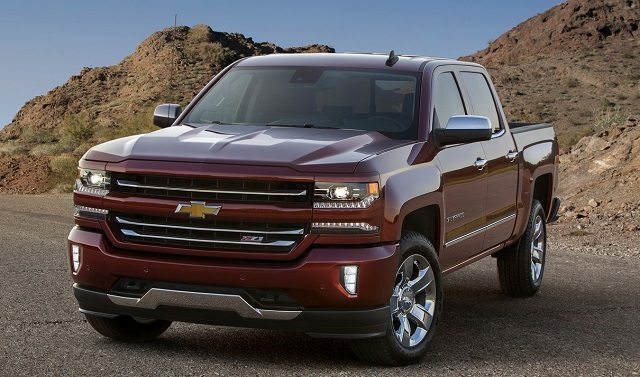 For a truck with all the diesel power you could want in a truck of this category and technology of the future, you just won’t get more for your money anywhere – and that’s a promise. When you think of Japanese vehicles, you probably think of efficient cars designed for everyday use. If not, perhaps you think of the growing luxury car market in Japan and how imports are making their way across the world in today’s economy. 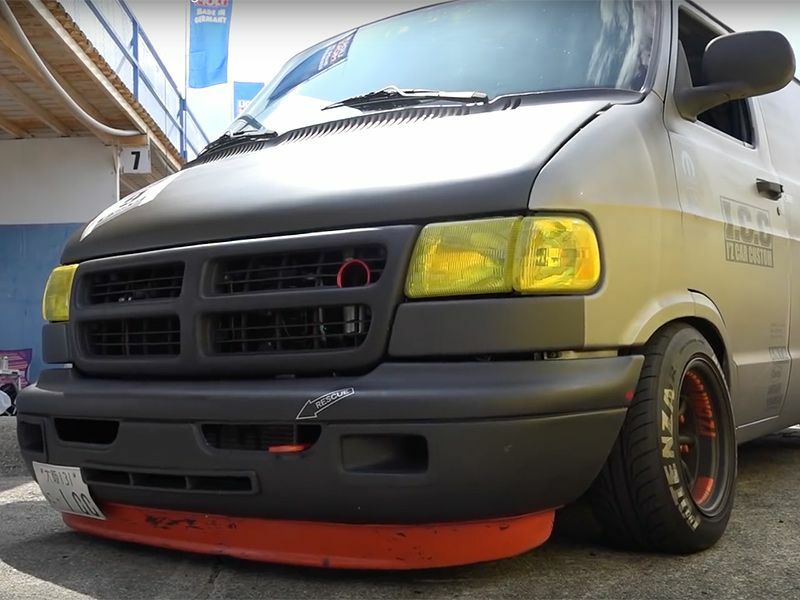 What you probably don’t think of are 1990s Dodge Ram vans. 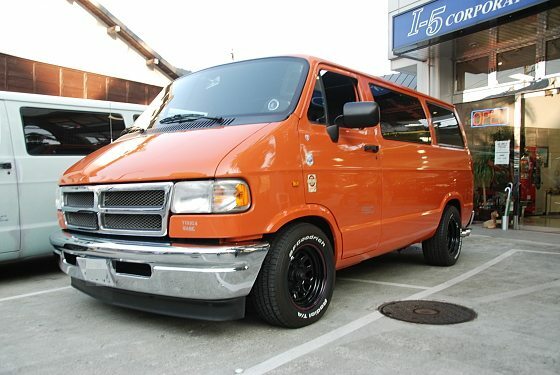 The interesting fact is that Dodge Ram vans are actually quite popular in Japan at this very moment. 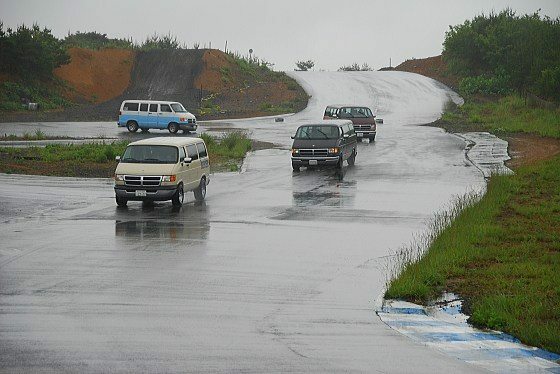 Keep reading to learn more about the ‘90s Dodge Ram phenomenon and how demand for this economical van has risen in an astounding manner, and for a very unique reason, in Japan. 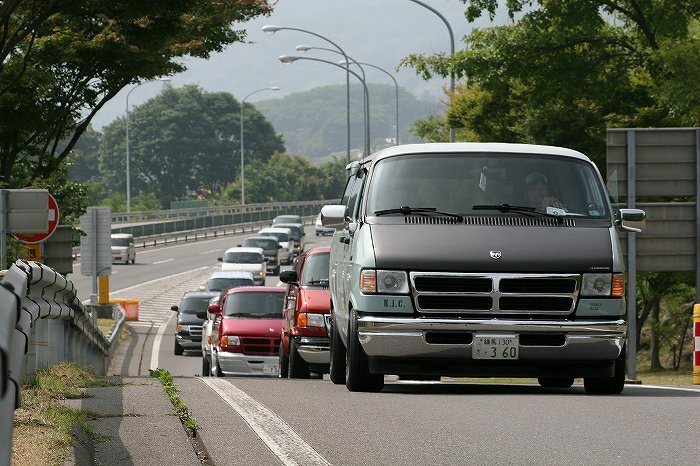 When you hear that Dodge Ram vans are popular in Japan, you assume that it’s because of their efficiency and ability to carry a lot of stuff, right? That’s what most people think when they first hear about the popularity of these vans overseas. 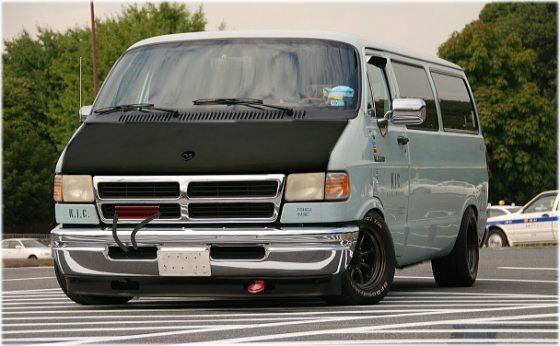 It turns out that the enthusiasm for Ram vans in Japan isn’t related to those attributes at all. Ram Vans are extremely popular because they’re being modified and raced on a track. While it isn’t exactly a mainstream sport in Japan, there is a whole unique sub-culture related to Ram racing. Created by Abe Takuro, Ram racing was an idea designed to break all of the rules. 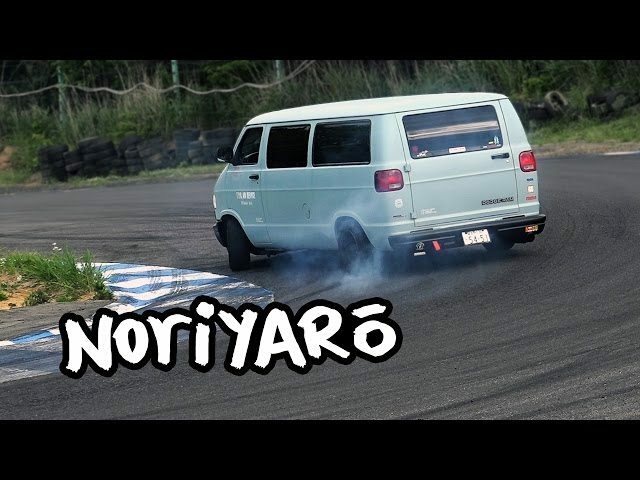 When working at a race track, Takuro dreamed of racing the tall vans they used to transport other vehicles and equipment around the track as a lark. Over time, his idea took off, though most tracks aren’t designed for taller vehicles at all. Now racers can even compete in the “D-Van Grand Prix,” once they get their Ram van race ready and know how to handle it on the track. 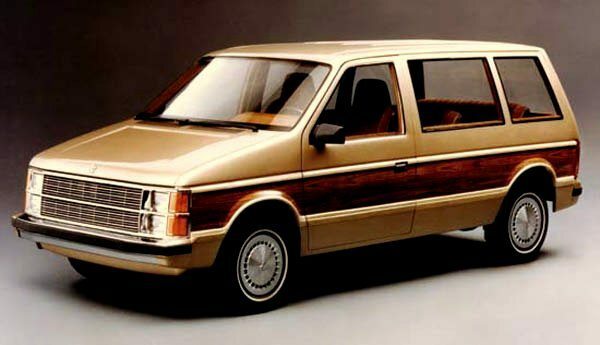 The 1990s Ram vans that are hitting the track aren’t exactly your standard models, though that could be pretty interesting as well. Instead, racers are heavily modifying their Ram vans and making them as close to real race cars as possible. From milled engines and cross-drilled rotors, to racing transmissions and top-notch Brembo brakes, these Ram racers are getting every bit of speed they can out of their vans. 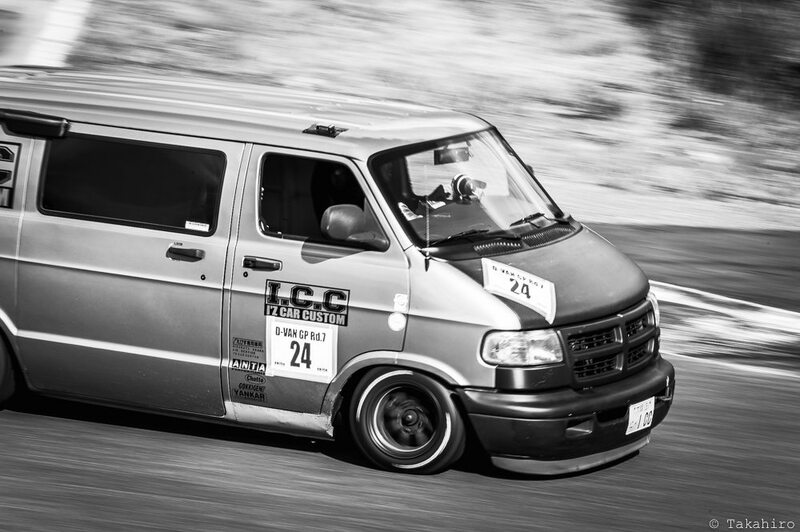 Many racers even outfit their vans with wheels that cost nearly as much as an entire older model Ram van. 1951 Bardahl – Not much can be found about this vehicle, though it is listed in Wikipedia as a Swedish brand. The company is a subsidiary of Bardahl Oil, maker of popular automotive lubricants used by almost every automaker in the world. The vehicle must have been a concept, or one off using experience gained in the aerospace or powerboat industries. It is a strange little car. 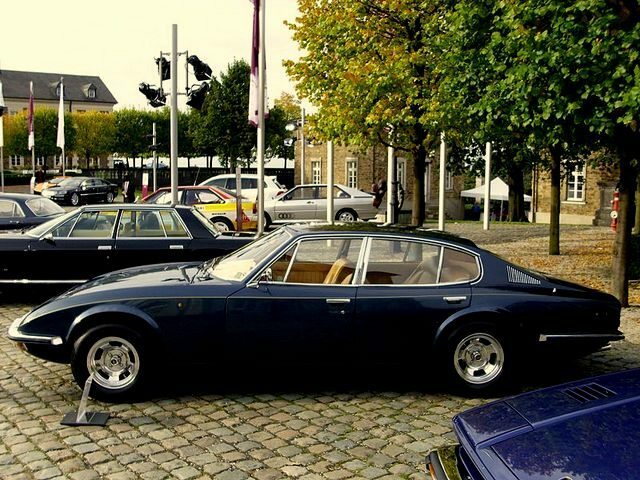 1971 BMA Amica – BMA is a very small Italian automaker that built three models of cars from 1971 to 1994. The Amica was a tricycle with a body made of plastic, complete with hinged doors. Power came from a 50cc engine. It reminds me of an amusement park bumper car. 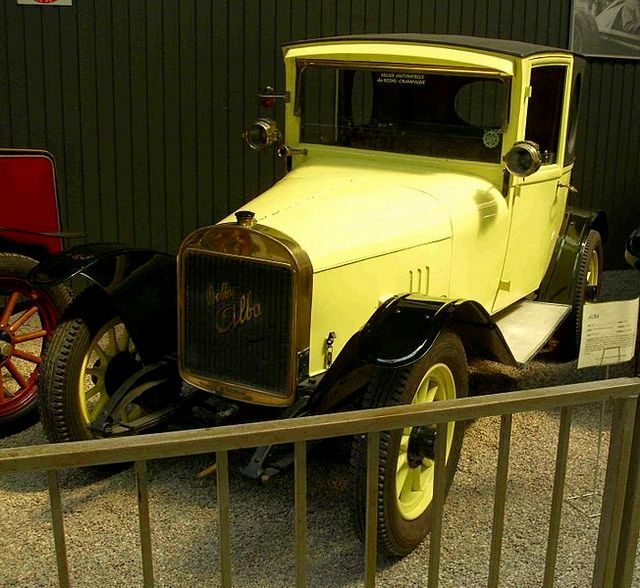 1919 Bobby Alba – This model is also known as the 6CV, and was built by Lucien Bollack from 1920 to 1924. The company was from France, and part of Automobiles Alba. It’s a rather cute car for the time. 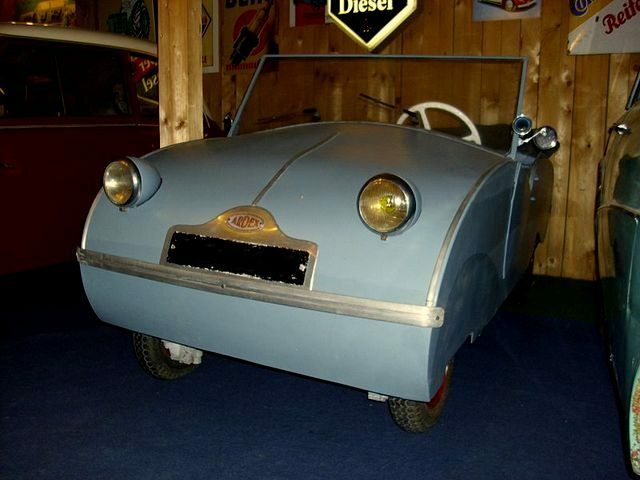 1950 Ardex – This was called the Microcar, and built by French car maker Ardex. 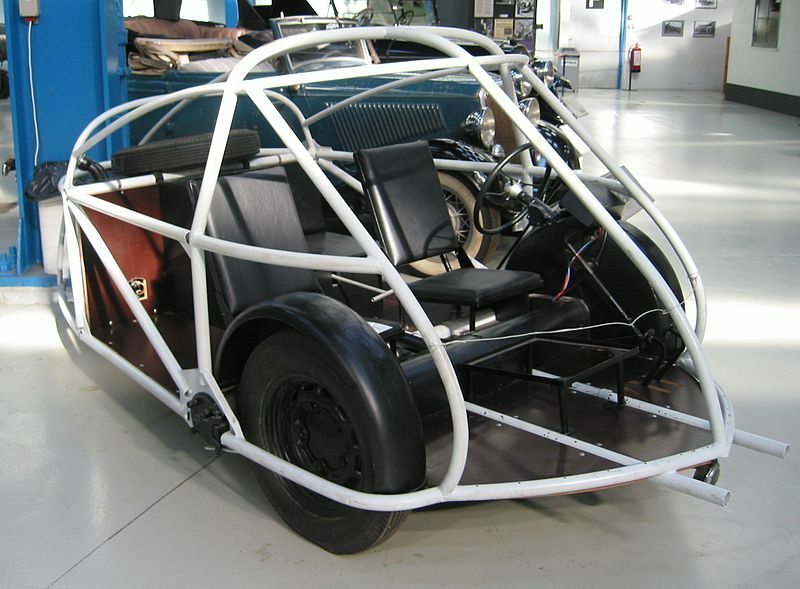 Founded in 1934, Ardex originally created a cyclecar, which followed the form of the Morgan three-wheeler. In 1937 they created a four-wheeler that was the cheapest car sold in France, and then added electric and pedal powered cars during WWII. Once the war was over, electric cars were banned and Ardex continued on until 1955 with this little beauty which sported 4 seats and a single cylinder two-stroke engine. 1971 ARH – ARH was a Spanish automaker from 1969 to 1972. 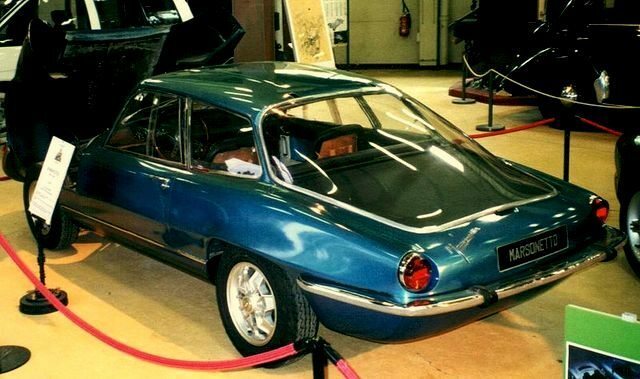 This Model was called the Condor, and sported a fiberglass body, a four cylinder 1200 cc engine from Simca. A total of 8 vehicles were built. 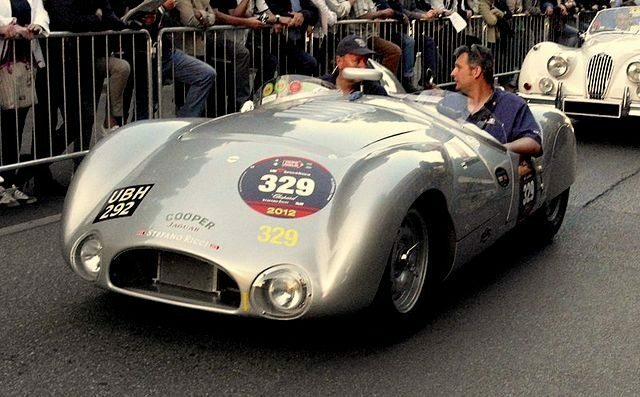 1954 Cooper T33 – Cooper is a well known British race car manufacturer with links to the Mini Cooper. The company is famous for its Formula One and Formula Three cars. This one is not so famous. 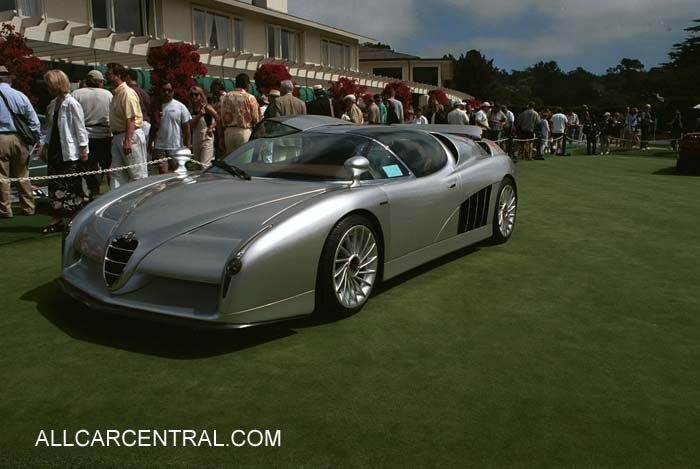 1996 De La Chapelle – Based on the German translation, I am guessing this was a French car maker, specializing in reproductions, similar to Panther. 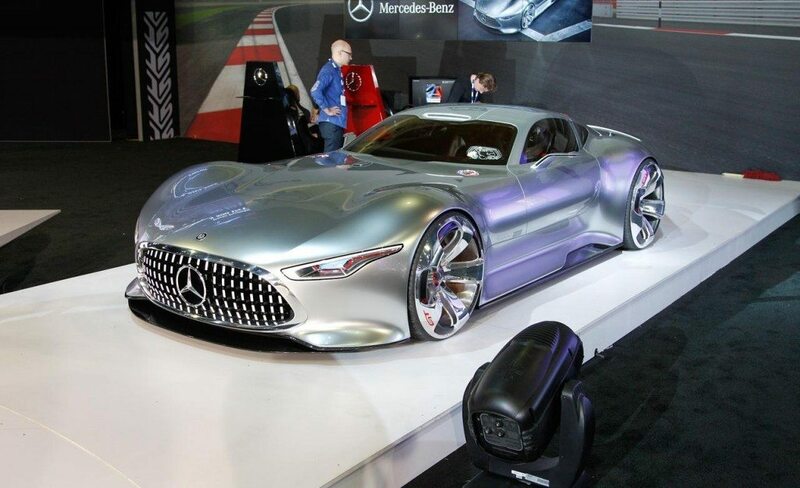 The car pictured is a concept car based on a Mercedes Benz engine. The car also made children’s cars, complete with a 4-stroke engine. 1955 Ermini – This was a car maker from Italy, and it created cars based on Alfa Romeo and Fiat chassis, with coachwork designed by everyone from Frua, to Scaglietti to Michelotti. 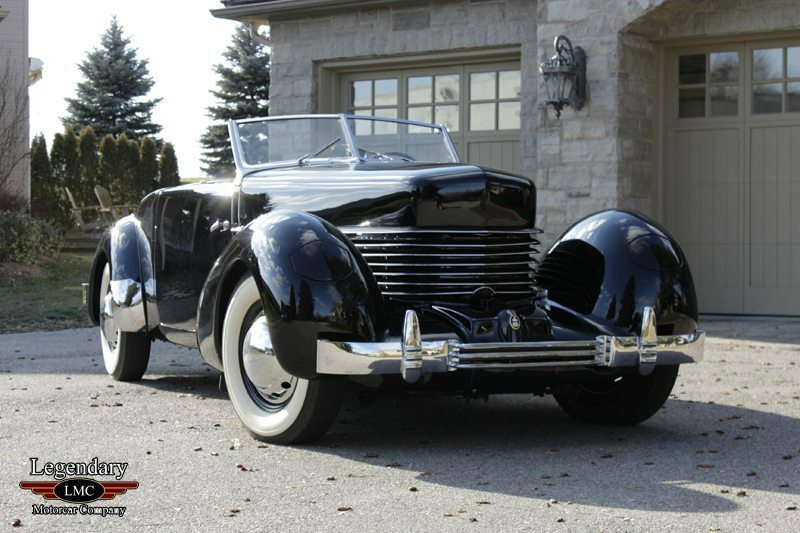 This car was also the basis for the Devin motorcar, built by Bill Devin. 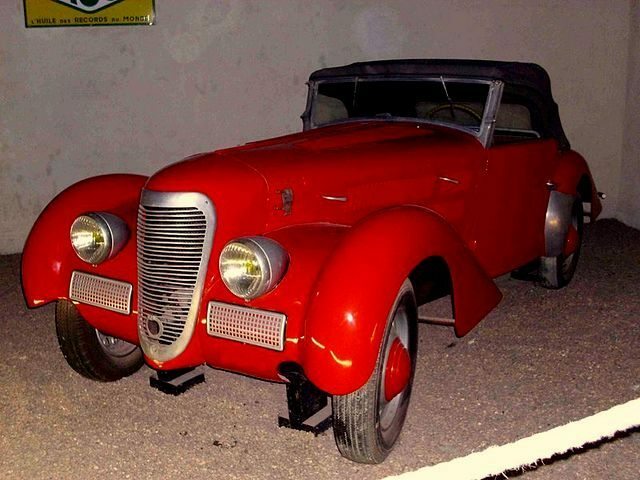 1939 Georges Irat – This is another obscure French carmaker, operating from 1914 to 1949. 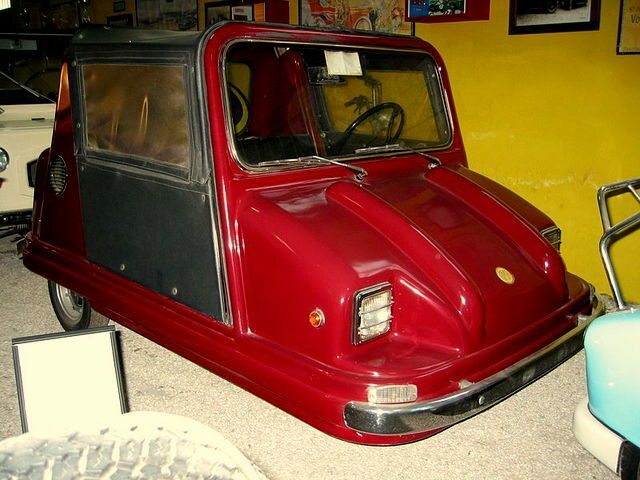 1994 Grecav – This cute little car is from the Italian car maker Grecav. Again, not much information is available, except in German…but this company took over BMA, maker of the Amica. 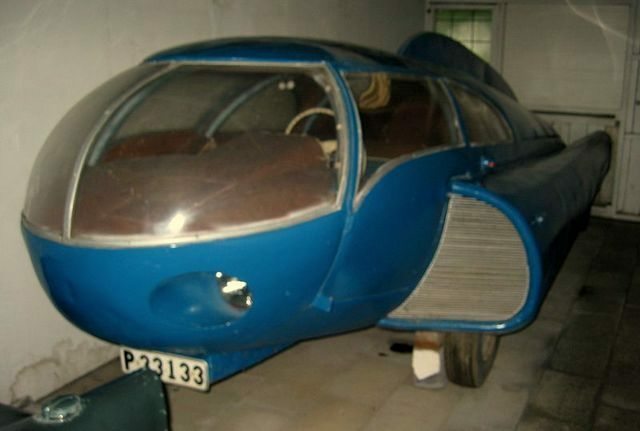 1956 Gregoire Sport – Gregoire is another French car maker, building cars from 1947 to 1972. They created three models of cars, selling only 10-15 copies of the Sport. 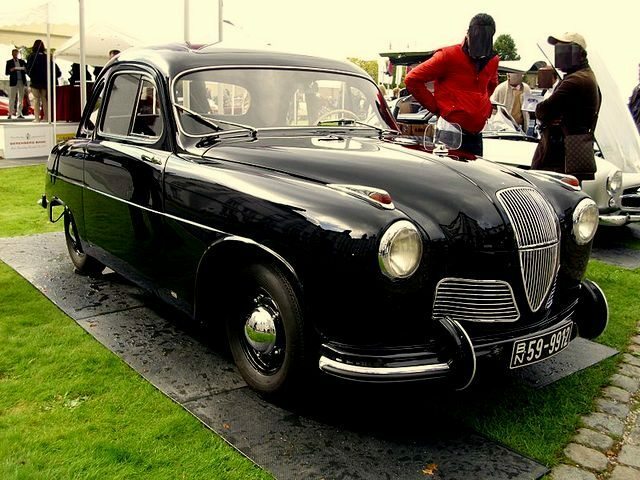 1951 Hanomag Partner – This German car maker created the Partner as a concept car. 26 total pre and post production cars were created before they decided to get out of the car industry. All but one of the cars were destroyed. 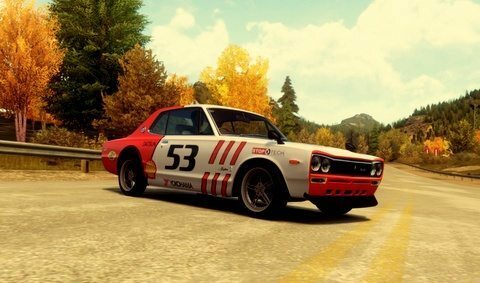 2000 Hommell Coupe RS – This car I recognize, since it is a favorite in Grand Turismo 5. 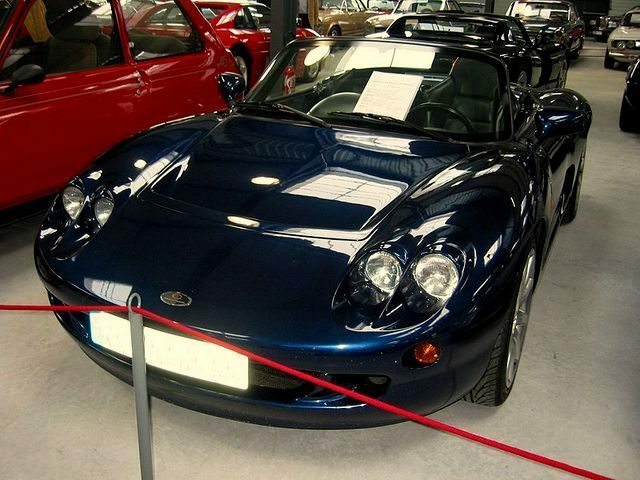 Hommell started building cars in 1990, creating four models until it finally ceased production in 2003. 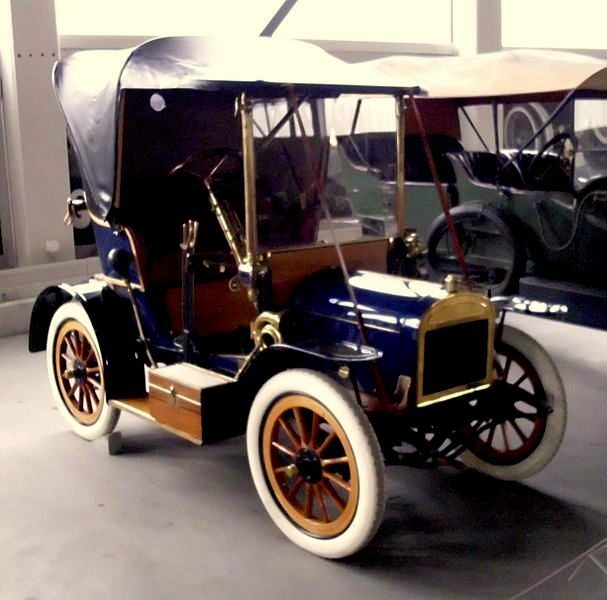 1907 Lacoste Battmann – This French car maker built cars from 1897 to 1913. The funny name “Battmann” is the reason I included it here. 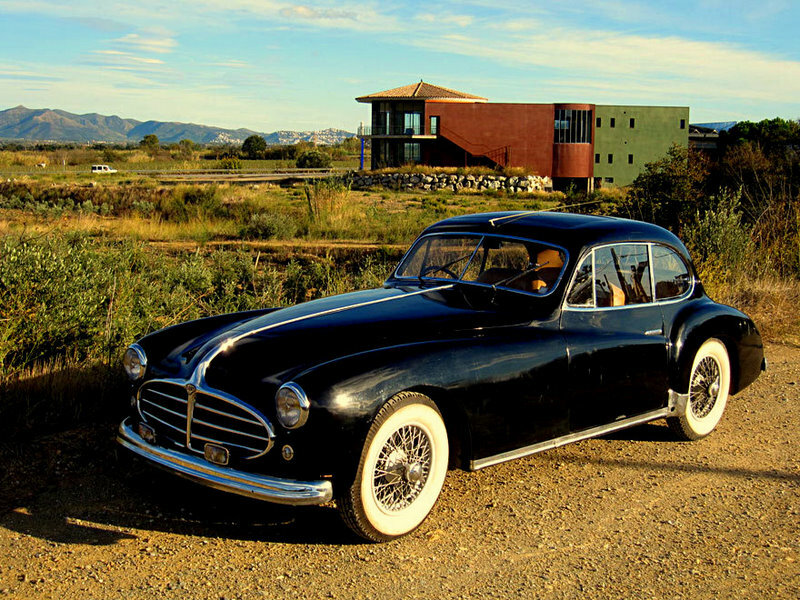 1968 Marsonetto – This started as a French car maker in 1947, and then owner Mario Marsonetto started building cars in the US from 1957 to 1972. The model pictured here is called Luciole, designed by Baptise Luciole. It came with either a Panhard two-cylinder, or a Renault 4-cylinder engine. I think the design of the rear glass and B pillar makes it a strikingly beautiful example of French design. 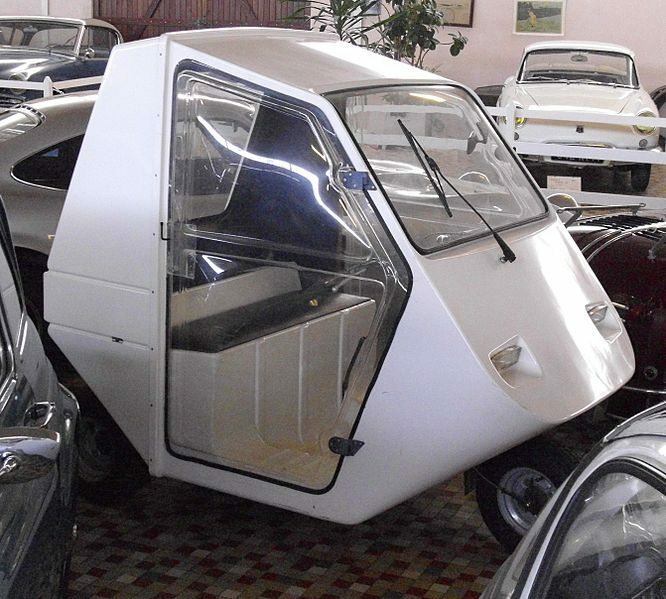 1972 Monica 560 – This small French carmaker built cars from 1970 to 1972. Only 8 production cars were created before the end came. It reminds me of the DeTomaso Deauville. I love this car. 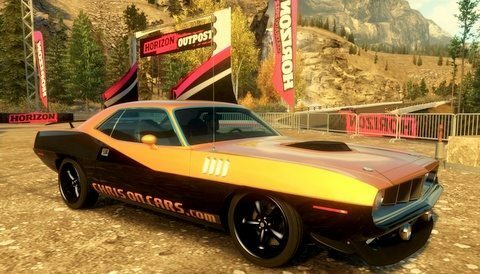 It is the old style Challenger, and I updated to reflect the Chris on Cars logo and website colors. It is available for upload, and surprisingly there have been a few takers. 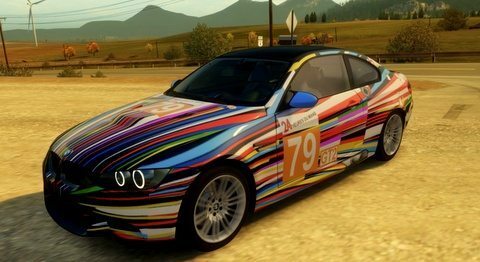 BMW Art Cars are another favorite, and this is a pretty good job of recreating the original. 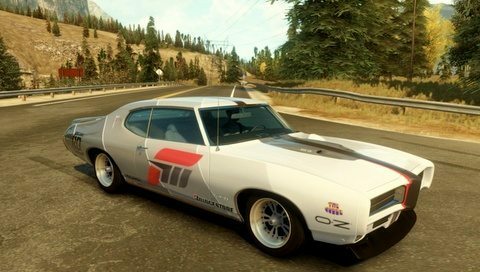 This is a Pontiac GTO Judge. I was never a fan of the 1970’s style decals, and decided to update the look to something more modern. Another car that was hard to update. This older Datsun is sporting a racing style design a’ la Marlboro racing livery. 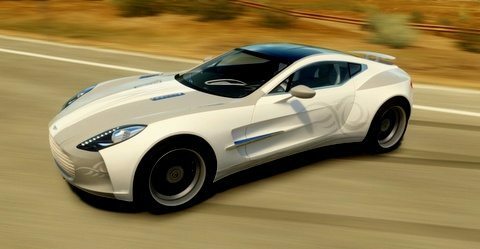 This Aston Martin One-77 is one of my favorites. The white on silver paint scheme is accented by some tribal work on the front and sides. One cool car. What do you do with a Land Rover Discovery? I didn’t see any UN cars in the marketplace, so decided this was a great option for this SUV. Ferrari F50. Not my design, but makes the car look fantastic. The attention to detail on the Blancpain racing livery is outstanding. 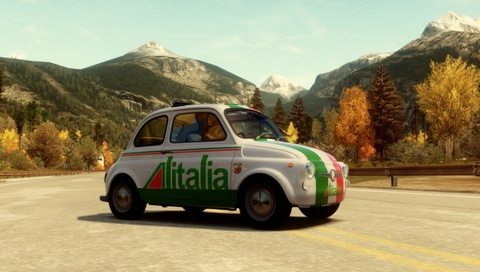 This little Fiat 500 is pretty cute with standard Alitalia livery. 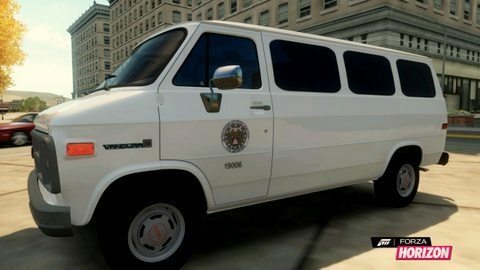 The GMC van is a replica of a Civil Air Patrol van I used to drive. In real life I rolled it in a curve and almost killed myself. 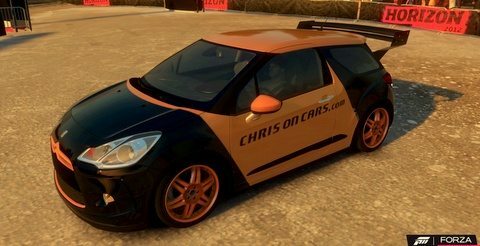 This little Citroen is done up in Chris on Cars colors. Not only is this a great car, but in real life it is a favorite among the tuners in Europe. The icon of the 1960’s, the Jaguar XKE is reborn as this Eagle GT. In real life this is a $500K car. Here in the game I can afford to own it, and have updated it with simple highlights on the exposed fenders. 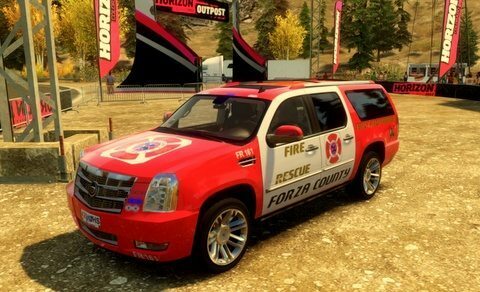 The Cadillac Escalade is perfect for a fire rescue vehicle, though I am considering redoing it in black with Presidential seals. 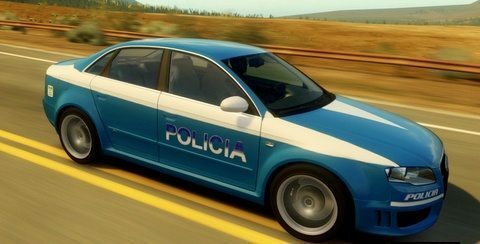 This Audi is one of the few sedans in Forza Horizon, so it was a natual for the Italian police livery. Of course the Carabinieri would never use a German sedan, but it will have to do until a Alfa sedan is available. 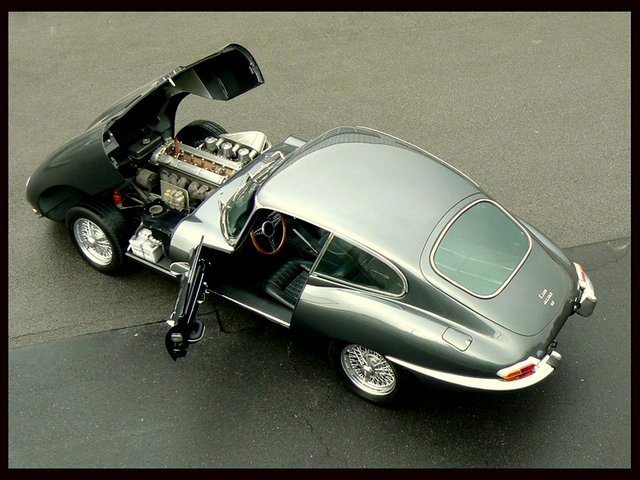 The Jaguar E type coupe is one great car. Outfitting it in gold and black livery looks pretty cool in the back roads of Colorado. This Lambroghini Aventador took a long time for me to finish. I tried to get a shark like appearance, and this is about as close as I could get. Surprisingly, this is not as popular as I expected among the design buying Forza fans. 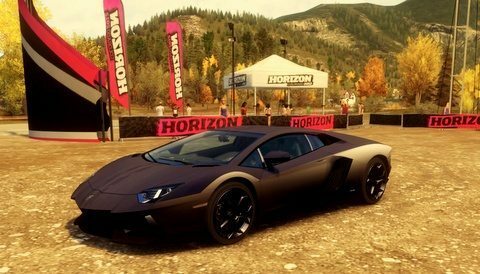 Police cars are a big hit in the Forza Horizon marketplace. 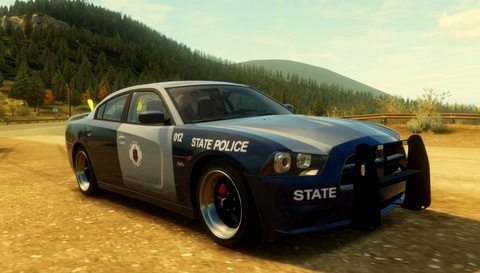 I started with a standard black and white car, and then added in this replica of the Massachusetts State Police. All it needs now is some working lights and a siren. This Chevrolet Corvette is based on a WWII bomber design. I especially like the rivets in the aluminum bodywork. This Lancia is another design that I purchased. 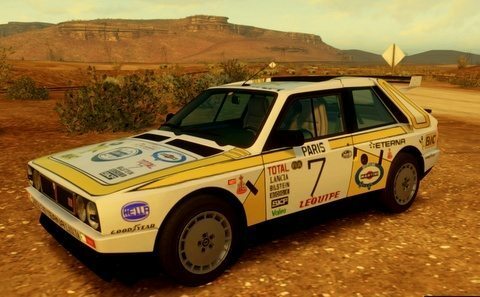 It is a replica of a rally car, and the attention to detail is pretty amazing. 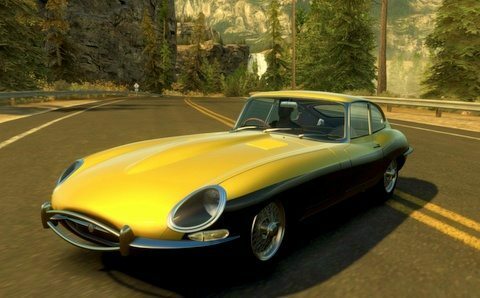 Forza Horizon is one of the best racing simulators out there, and I am addicted to the design studio. If anyone is interested in trading designs, or looking me up, my username is roadster2005. Hope to see you on the roads soon. Discoveries can be found in even the most mundane of places. In this case, I was researching a website named BigBoyToyz.com for an article. What began as a simple project, turned into an afternoon of interesting reading, fun videos, and an excessive amount of drooling over some amazing supercars. 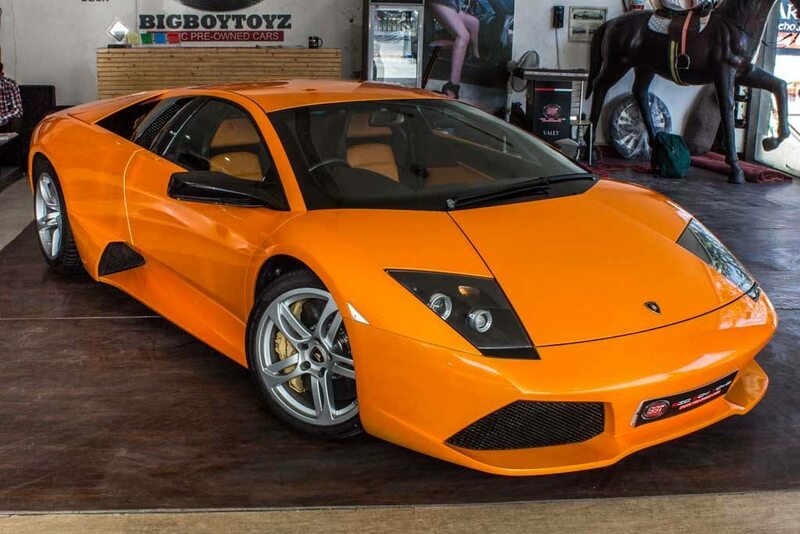 BigBoyToyz is not your typical premium used car dealer. 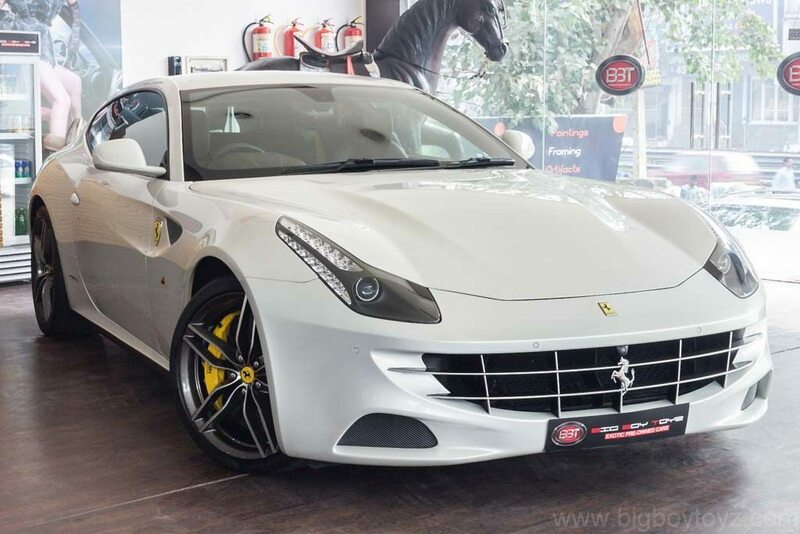 Established in 2009 in Gurgaon India, the company offers some of the most exclusive cars on the planet. Promising to raise the standards of the industry, the company focused on ultra-luxury brands and supercars. 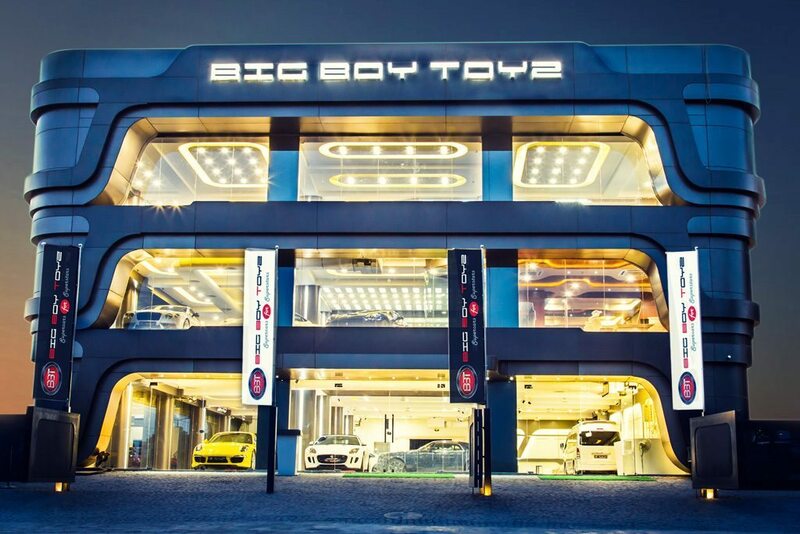 BigBoyToyz has gathered a collection of the finest whips in a mind blowing showroom…It is the Versace of used car dealers. The cars are phenomenal, from Ferrari to Lamborghini, to Rolls-Royce and Aston Martin. If there is a reality star or rapper driving it in Hollywood, then there is one just like it for sale here. Like some of the exclusive car dealers in the U.S., they cater to the rich and famous. In fact, there is even a celebrity page where you can see many famous actors and musicians visiting the showroom. 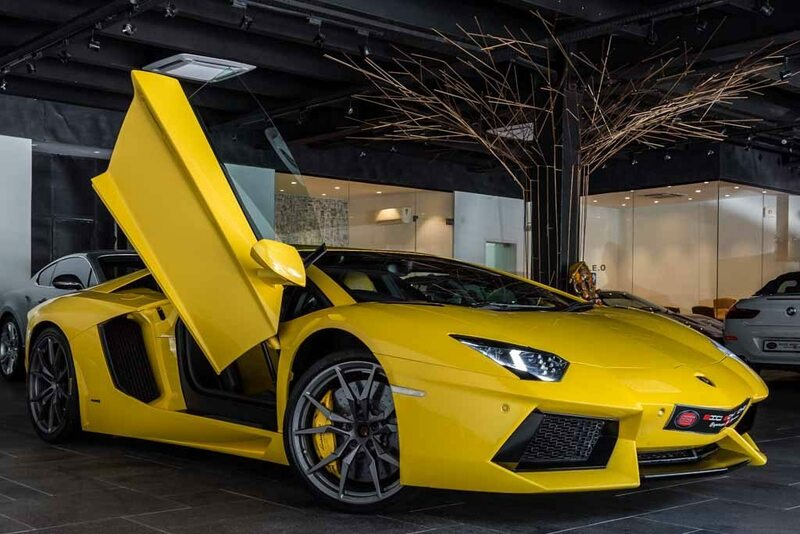 Some of the highlights of the site include an amazing Lamborghini Aventador LP 700-4 in Giallo Evros (yellow) and a Mercedes Benz SLS AMG in silver. Both cars are incredible, and are must have cars for any collector. 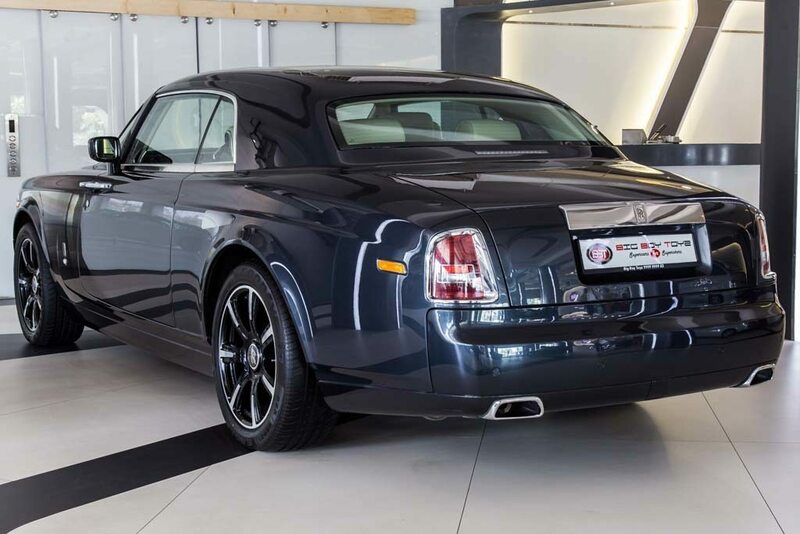 Also listed is a Rolls-Royce Phantom Coupe in Dark Tungsten. 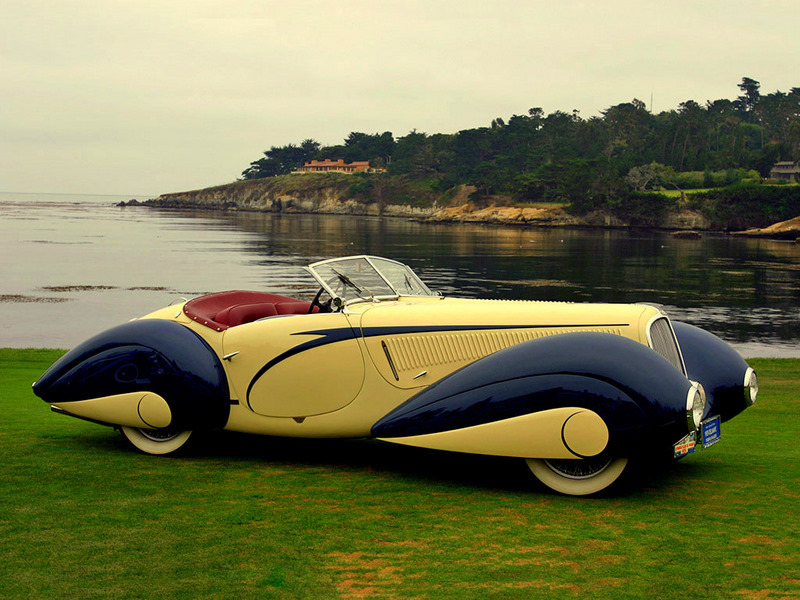 It is a stunningly beautiful automobile, and relatively rare. 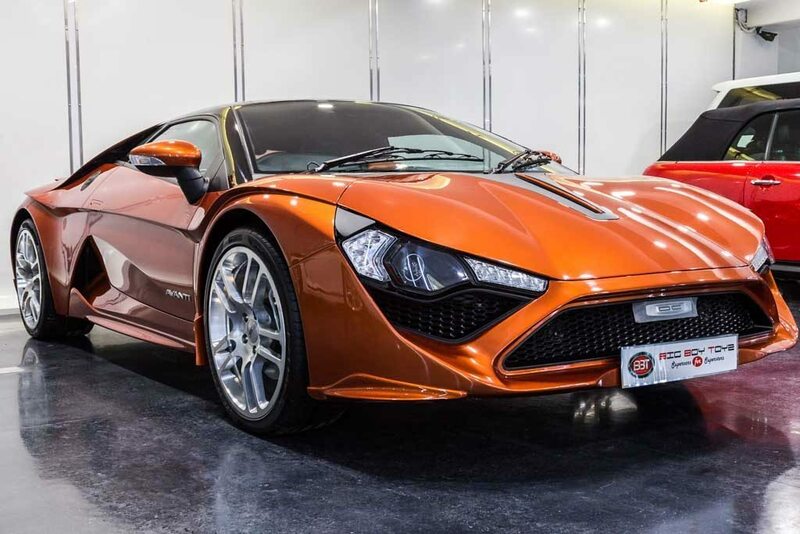 However, the car that really surprised me was a car I had not known about prior to visiting this website, called the DC Avanti. 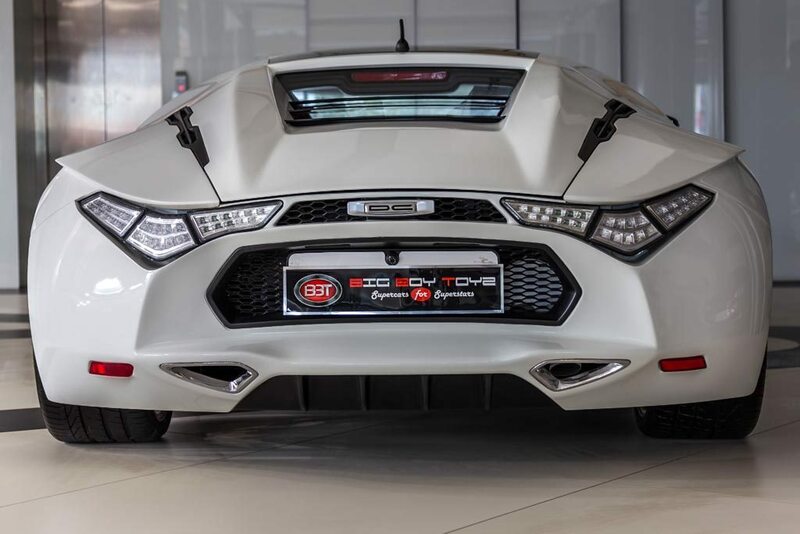 The Avanti is a sleek, low slung sports car completely designed and manufactured by the Indian car brand, DC Design. Sporting a 2.0 litre 4-cylinder turbo engine, it pushes out 250 horses, and can do 0-100kmph in about 7.7 seconds. Built using lightweight carbon fiber both inside and out, the car is not supercar fast, but it is certainly supercar stylish. They have a slew of other brands on offer and have a collection of used cars from marquee brands like BMW, Mercedes, Jaguar, Audi and what not. You name it and they have it. 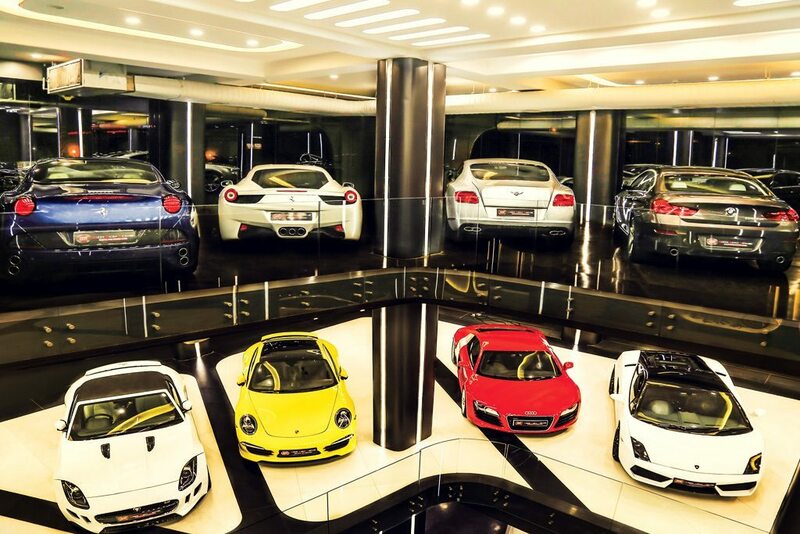 They have one of a kind car collection and the only word that comes to my mind is insane! BigBoyToyz.com is an interesting website, not only for the array of mind-blowing rides. It offers some fun videos that include everything from cool car commercials, to scenes of idiots driving supercars. 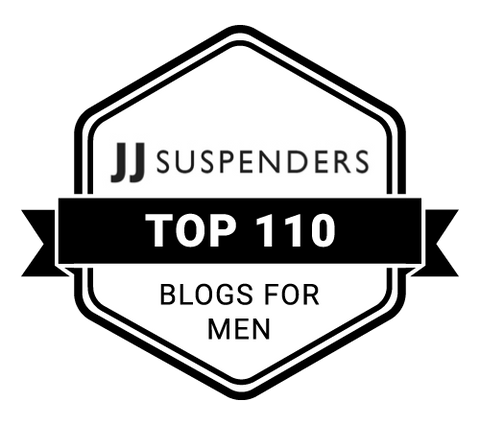 On the blog page, there are well written articles that cover everything from automotive news to interesting car factoids, some of which were even new to me. 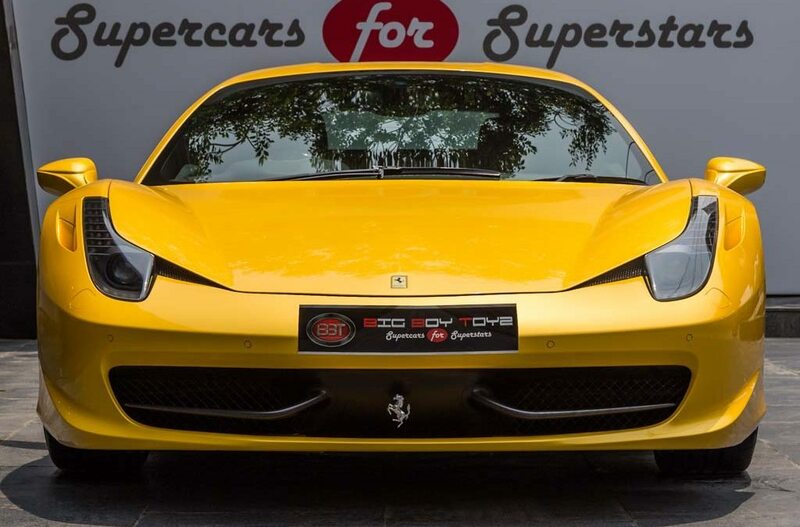 Overall, if you have the type of war-chest where you can afford to purchase the ultimate supercar, then this is the best place to shop in Asia. If not, it is still worth the visit just to check out the fun articles and videos. 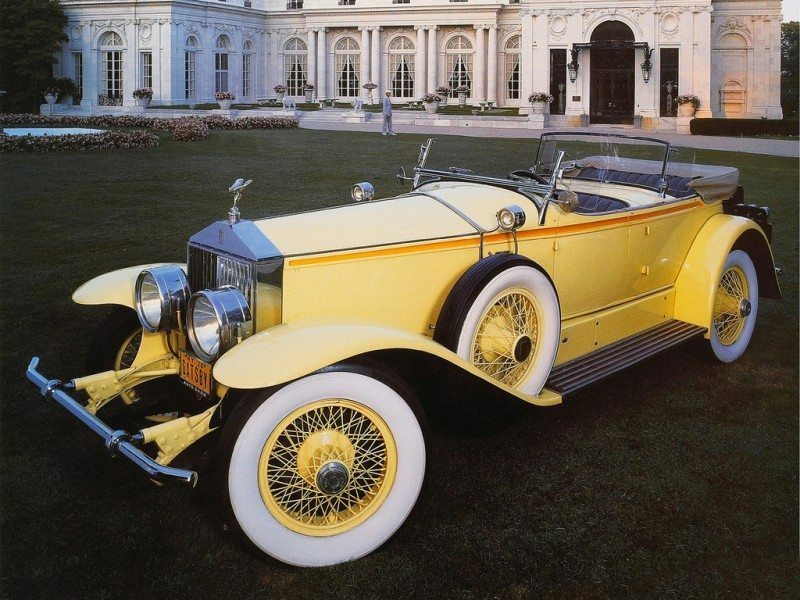 I have always considered the “Golden Age” of car design to be the period of the 1920’s and 30’s. 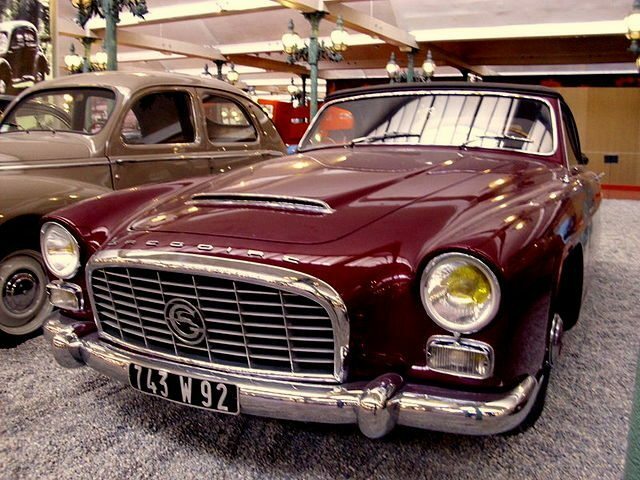 Sure, the 1950’s were great, with the introduction of the fin, huge chrome grilles and the beginning of the rocket age look, but true custom car design was at its peak during the time of the great coachbuilders, and the most flamboyant of the lot were the French. 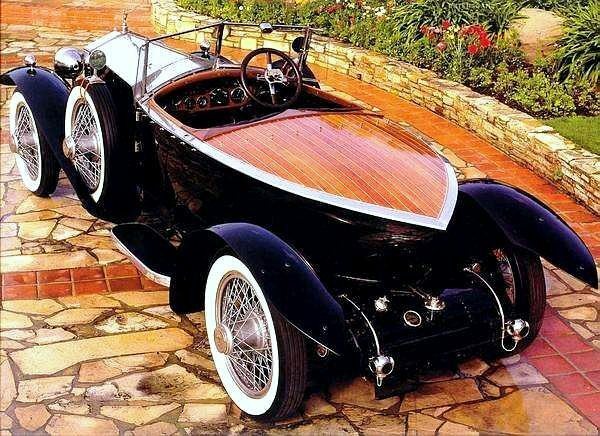 This was a time when you purchased a rolling chassis from an automaker like Duesenberg or Hispano Suiza, and then sent it off to a designer to create the bodywork. Designers would build cars specifically for you, like having a haute couture dress made. The result, were some of the most fantastic shapes to ever be placed on an automobile, and my favorite of the group was Figoni & Falaschi. After World War I, Giuseppe Figoni started a small body repair shop in Boulogne-sur-Siene, France. His work included modifying the coachwork of touring cars, and his business prospered. By 1925, he was building complete bodies on rolling chassis purchased from automakers including Delahaye, Bugatti, Delage, and Panhard. By 1935, he acquired a partner, Ovidio Falaschi, and created the Figoni & Falaschi name. Fascinated by the emerging aircraft industry, he was influenced by the shapes of airplanes, and the wind. 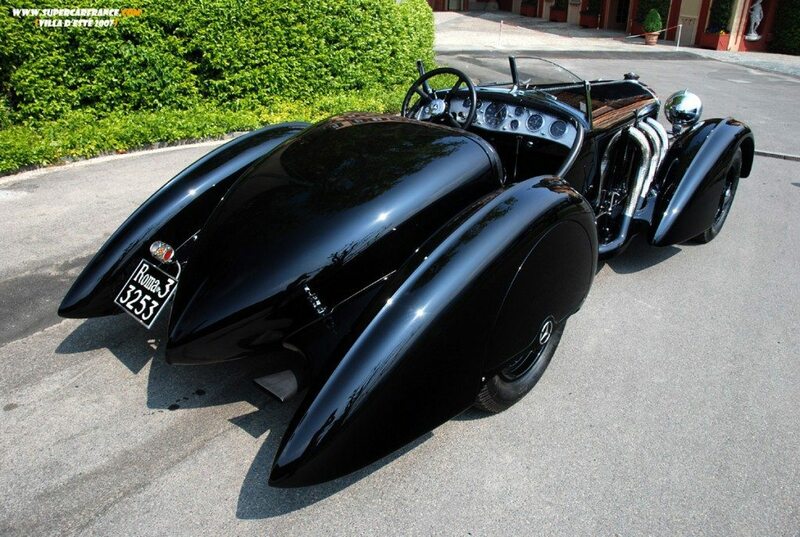 Figoni’s designs gave the impression of movement, even when the cars were standing still, and had an aerodynamic quality that would not be prevalent until the 1950’s. 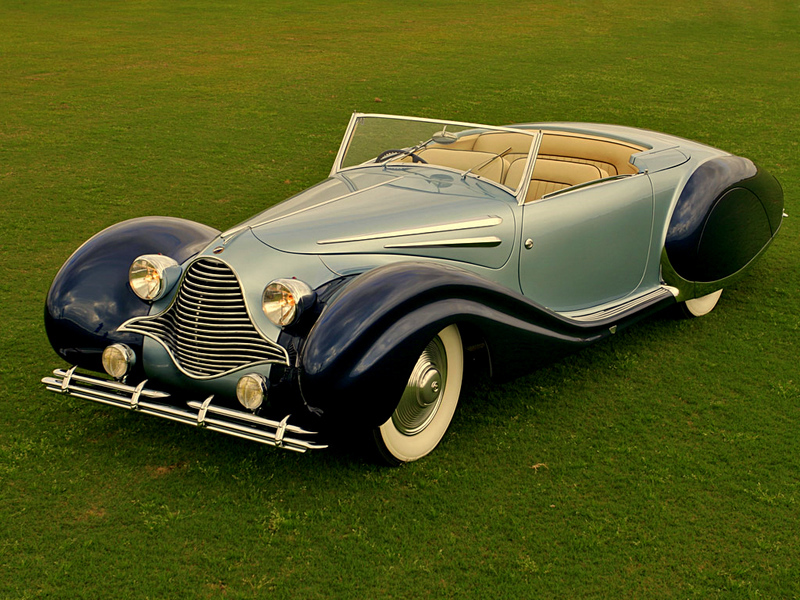 Figoni was fascinated with teardrop shapes, and his Delahaye 135, with its elliptical shapes and enclosed teardrop pontoon fenders created a sensation at the Paris Auto Show of 1936. Figoni had a command of color and design that was worthy of an artist, and favored two and three tone paint designs that would accentuate the shapes. 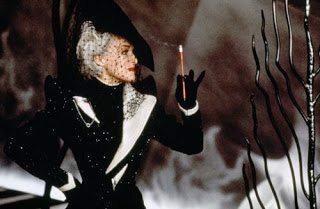 He loved to work with designers of high fashion, creating gowns, hats, gloves, and shoes that perfectly matched the design and colors of his cars. He was also involved in designing racing bodies, creating aerodynamic bodies for cars like the Alfa Romeo 8C 2300, a car that won the 1932 Le Mans, as well as other cars. The creations of Figoni & Falaschi were flowing masterpieces, cars that the buyer wore like fine ball gowns, and a style whose closest relative today would be the Morgan Aeromax. Their cars were an expression of freedom and movement, with enclosed wheels, and lines that made the cars float across the ground. Figoni was an automotive sculptor who created patented designs for disappearing soft tops and even a disappearing sunroof. 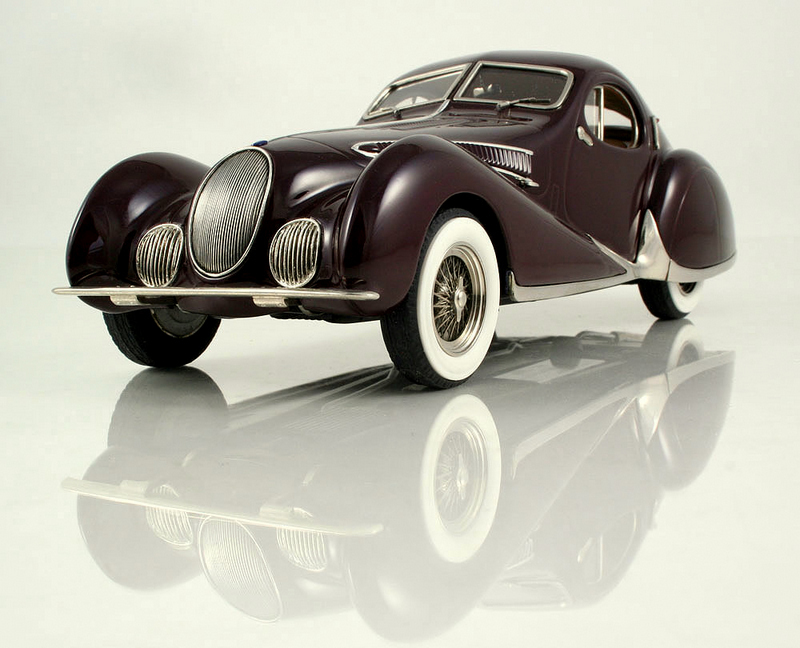 The hallmark of the brand is the Talbot-Lago T150 C, a car whose teardrop shape, flush door handles, and sloping fastback became the symbol of French coachbuilders. 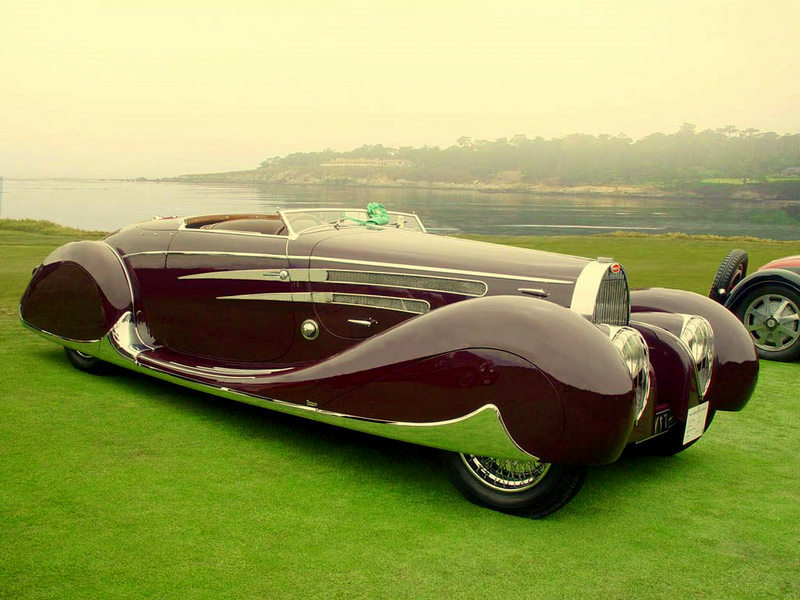 These cars were from a time when car design was true art. The automotive world is defined by its innovation. 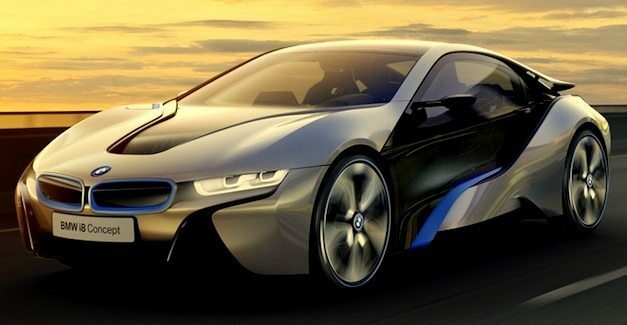 Unusual, boring and popular cars are plentiful, but it is the truly innovative machines that are remembered. This list of cars not only inspire, they were quantum shifts in the development of the automobile. These are the cars that changed the world. 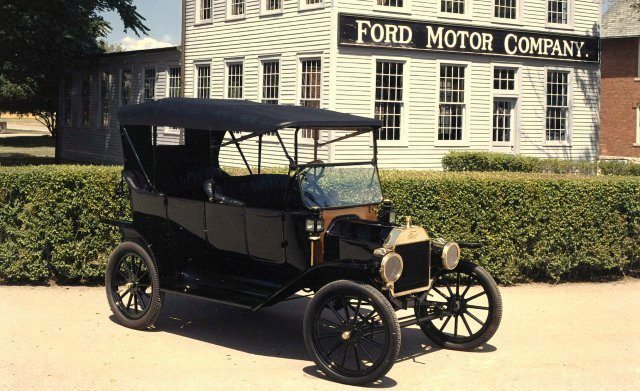 The Model T was the first mass-produced automobile, making it one of the most important cars in US history. This flimsy little car created the automotive industry, urbanized a nation, and gave mobility to the masses. The manufacturing process that created the car was even more influential. Almost every industry or market in the world can trace its roots back to the process refined by people like Henry Ford and Frederick Winslow Taylor. When it finally ended production in 1927 with over 15 million cars sold, half the cars in the world were Model T’s. Dubbed “The Best car in the World” by Autocar magazine, the Silver Ghost transformed luxury motoring as well as modern warfare. 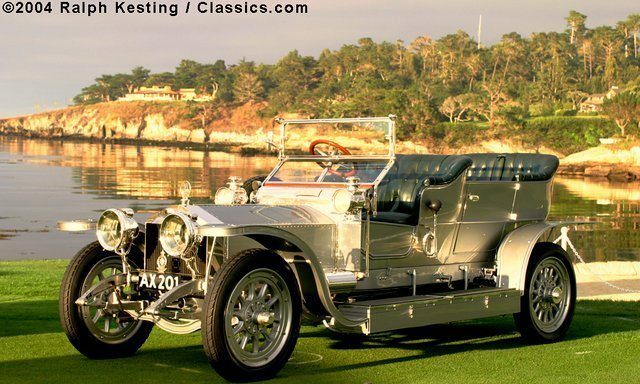 The Silver Ghost had a significant role in the Turkish wars with Laurence of Arabia, Gallipoli, the Irish Civil War, World War I, the development of India, and was still in service during World War II. Through its combat use, the Silver Ghost ushered in the era of mechanized warfare and virtually ended the days of the horse cavalry and artillery unit. Most examples are still on the road today, and the earliest is worth an estimated $200 million dollars. This tiny car is genesis for the modern automobile. The Seven borrowed the driver controls from the limited production Cadillac Type 53, and mass produced it throughout the world. It was the first “people’s car” and the first production model for many major manufacturers. 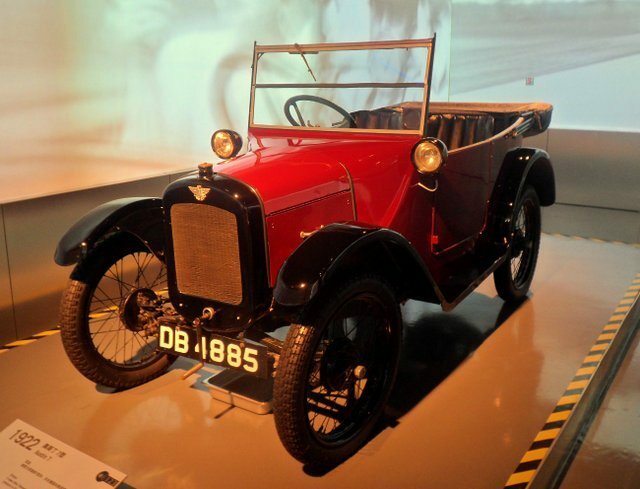 The Austin Seven and its re-bodied siblings virtually gave birth to BMW in Germany, Nissan in Japan, Holden in Australia, Rosengart in France, and Lotus and Jaguar in England. 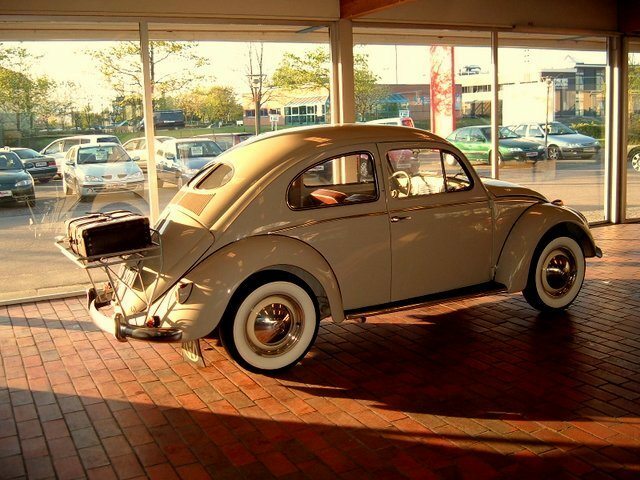 The beetle has an amazing history. It was designed by Ferdinand Porsche based on specifications made by Adolf Hitler. It is one of the first rear-engine cars, with one of the first air-cooled engines, designed to travel at 100kph on Germany’s new Autobahn. The Beetle is the longest running and most manufactured car of a single design platform, worldwide. The production lasted 65 years, ending with 21.5 million cars in 2006 for Brazil and 2003 for Mexico. The Beetle has had books and music written for it, has become an icon and a movie star, and was an inspiration to a generation. Its namesake the “new” Beetle is still in production to this day. The Mini is an icon of the 1960’s. Designed as a car for the masses, it is the first to use a transverse front-wheel drive layout. It is the genesis for all modern front-wheel drive cars and spawned the hot hatch era. 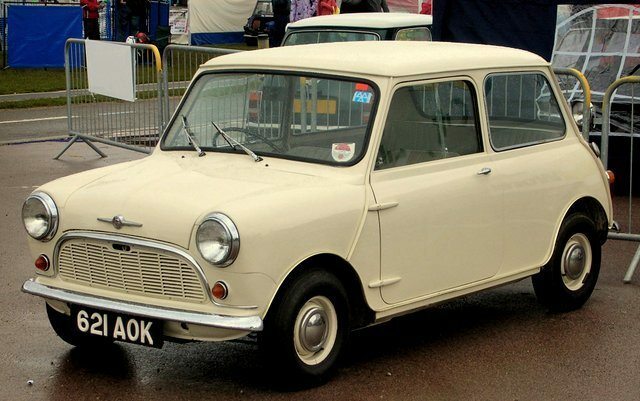 The Mini was voted “Car of the Century” and produced over 100 variants in countries all over the world. Not only is this little people carrier a great city car, the Mini has a stellar record as a race car, rally car and movie icon. 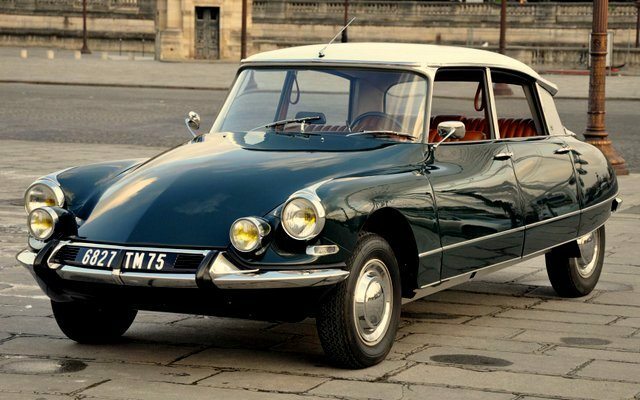 Decades ahead of its time, the DS (Goddess) is one of the most celebrated designs in automotive history. With its quirky scarab shape, hydraulic suspension, and turning headlights this car became a European icon that has consistently topped the “Most Beautiful” and “Most Important” lists throughout the world. Whether it is the aerodynamic styling, the mechanical innovation or the pure space ship like design, every modern car on the road can trace its roots back to this automobile. The DS shocked the world, and sold a record breaking 12,000 examples on its first day. The list of its innovations to the automotive world would fill a book. It is sculpture, art…it is a Goddess. The E-Type is simply “The Most Beautiful Car Ever Created.” The car is in the permanent design collection of the Museum of Modern Art, and has been an inspiration for everything from cars to clothes. It is mesmerizing as a piece of art, and merely adequate as a car. Designed by Marcello Gandini, this automotive icon is the world’s first supercar. The Miura changed the conception of what a sports car could be, and introduced the world to a new level of motoring. With its bull inspired design, its transversely mounted V12, and its lightning quick speed, this was the genesis for cars like the Pagani, the Bugatti Veyron, McLaren and the modern Ferrari. 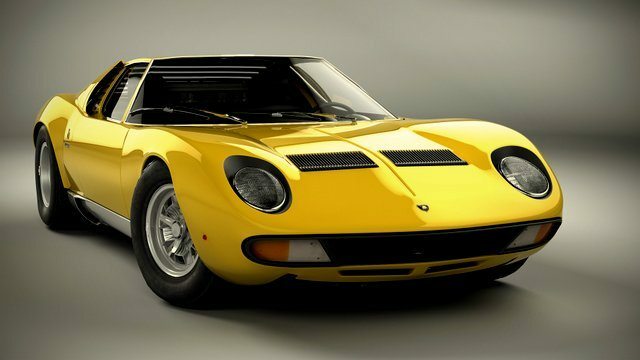 The Miura launched Lamborghini and ushered in a period of amazing, outrageous supercar design. The Dodge Caravan and its Chrysler siblings revolutionized the modern automobile. Not only did it create the minivan market, it helped give birth to the SUV and crossover markets. Arriving 18 months ahead of its only competitor, the Renault Espace, this vehicle became both an icon and joke to the American family. Owning one was at first a sign of success, and a sign of “lost youth.” The Minivan is now as much a part of the America family as the ranch home and the suburbs. Just as the Model T and the Chrysler Minivan changed the world, so did the Toyota Prius. 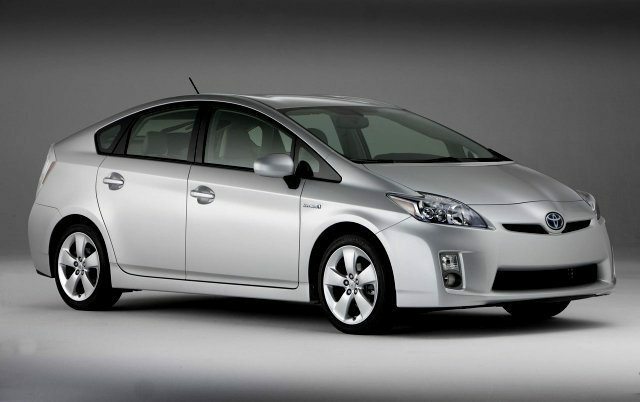 The Prius was the first mass produced full hybrid electric vehicle in the world. 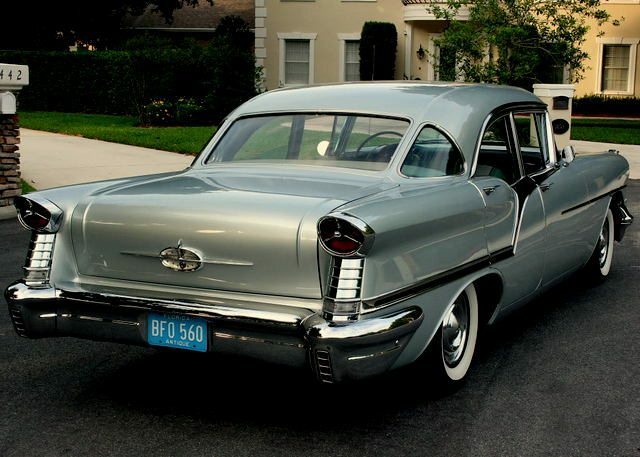 It became a status symbol in America when first introduced, and remains one of the cleanest vehicles sold in the US. Like the Model T and the Volkswagen Beetle, the Prius is a major step in the evolution of the automobile. 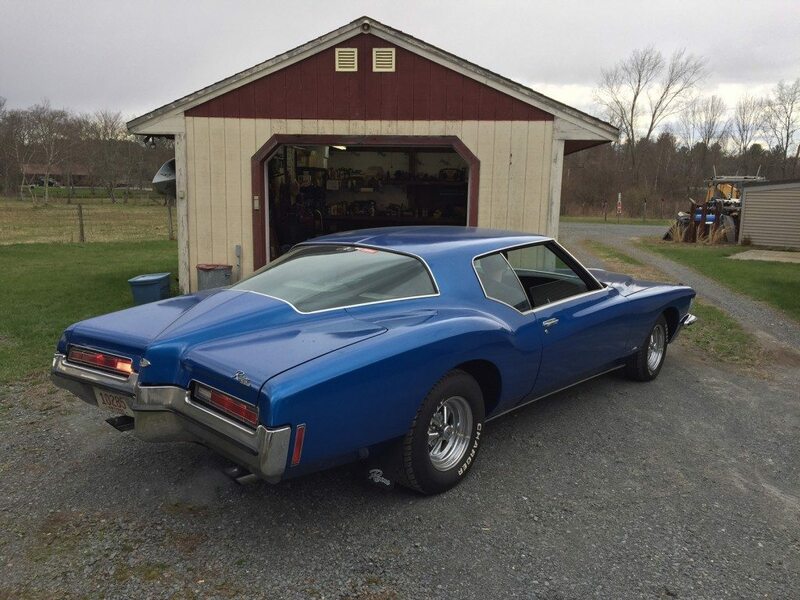 Every once in a while I find some great cars on eBay. Now that summer has officially started, I decided to take a look at eBay and see what they had to offer in the way of summertime cruisers. 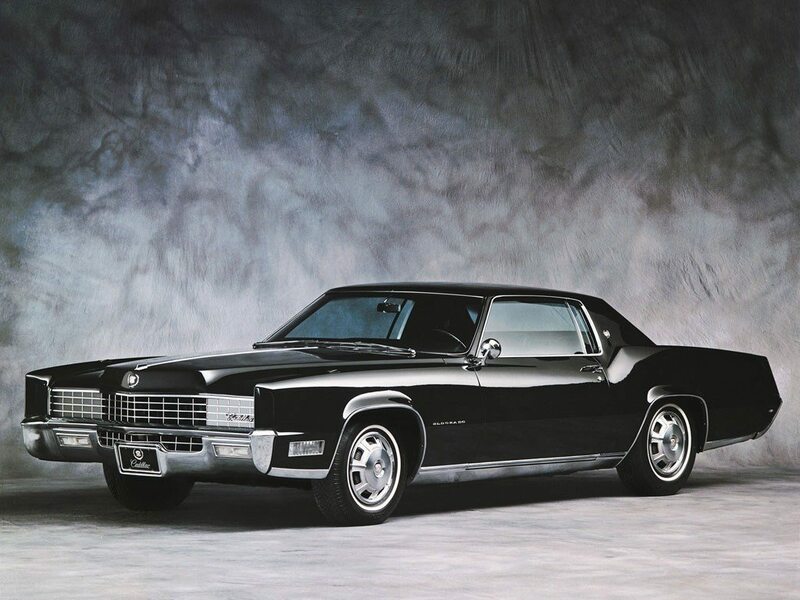 When I was younger, I had a perfect 1976 Oldsmobile 98 Regency Hardtop, and I loved to gather up the family and head off to the local ice cream shop on a hot summer night. 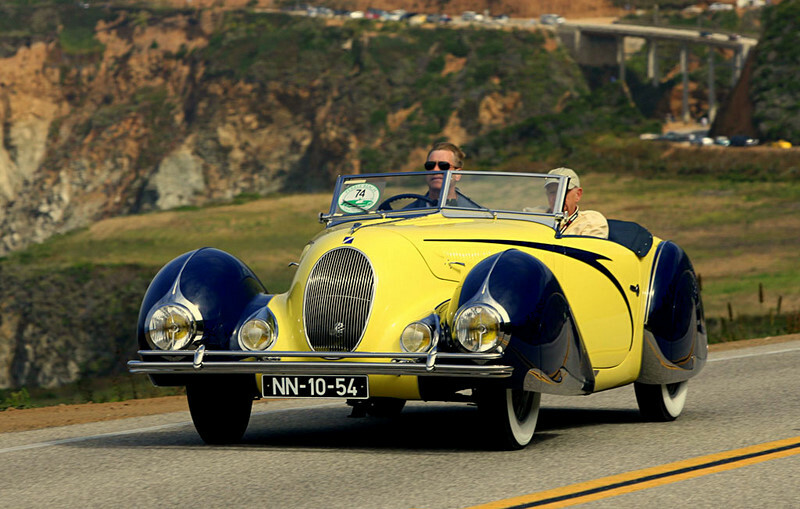 Classic cars and especially convertible classics are the best cars for summer. Taking a sunset cruise along the beaches and small towns of Cape Cod in a 1950’s classic is something everyone should do. So here are some great eBay finds for anyone looking to have an amazing summer. 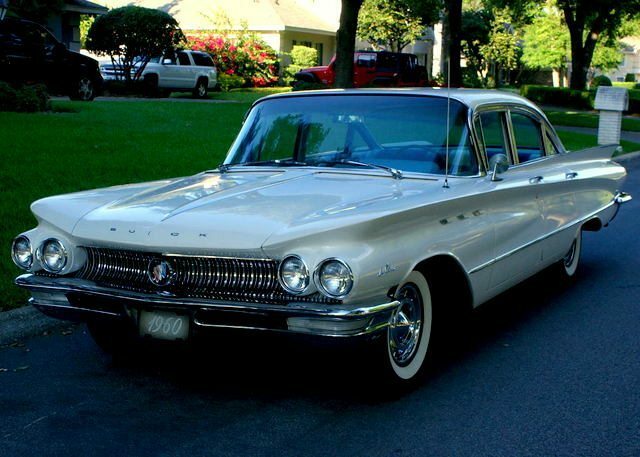 1960 Buick LeSabre – $9,700. 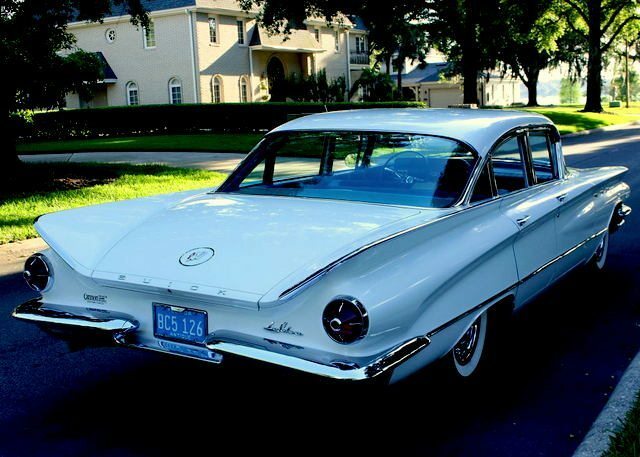 This is an excellent condition Buick sold and owned in the same Lakeland Florida neighborhood for the past 53 years. The color makes this car a classic, and removes the darker aura given off by the front and rear styling cues. With a brand new interior, this car is ready for a nice summer car show. 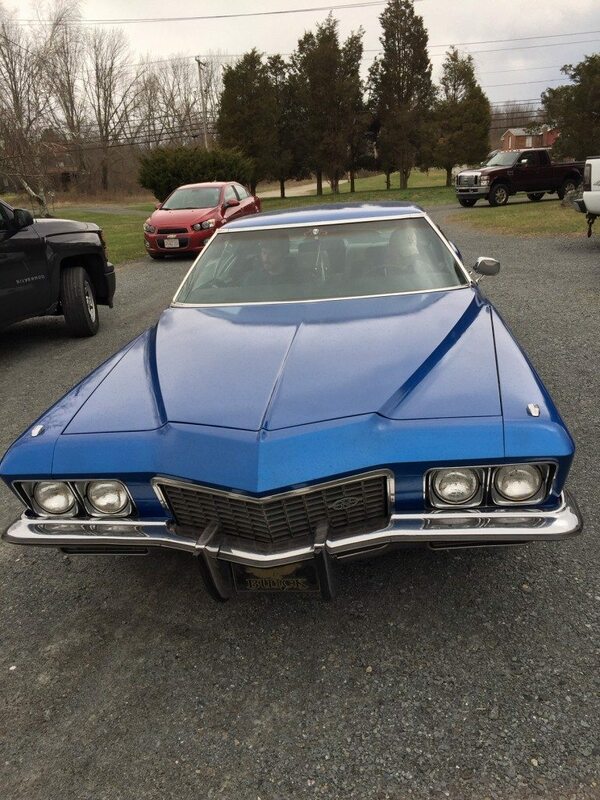 1970 Buick Electra 225 – $5,200. 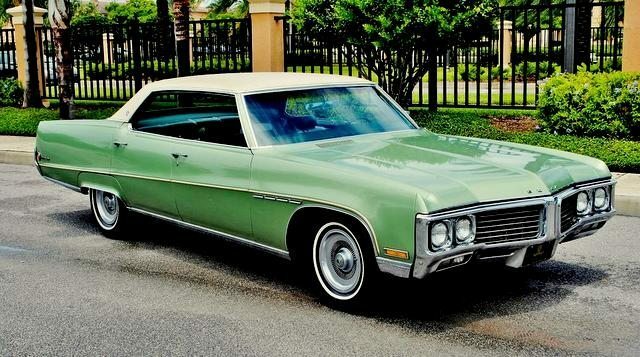 Another stunning Buick, this time in Jade Green with a white roof. 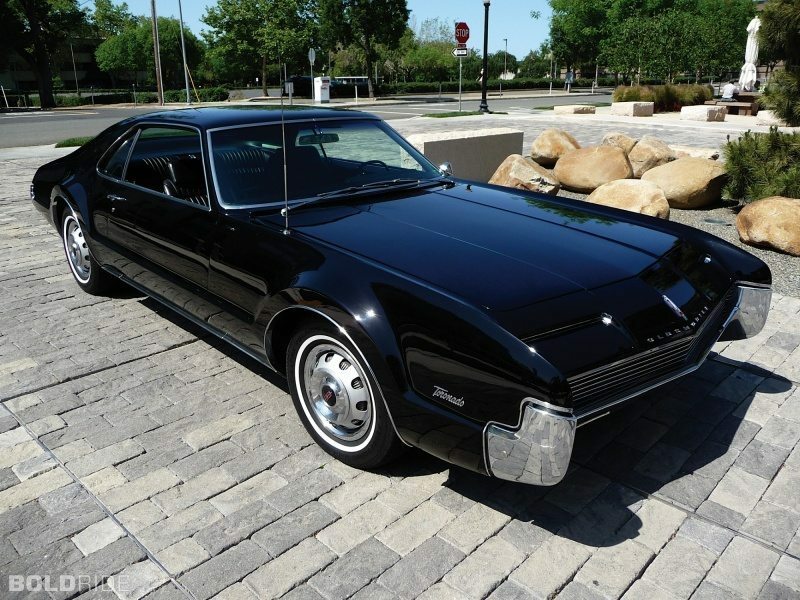 This custom 4-door hardtop is pillarless, and has only 17,800 miles on the odometer. 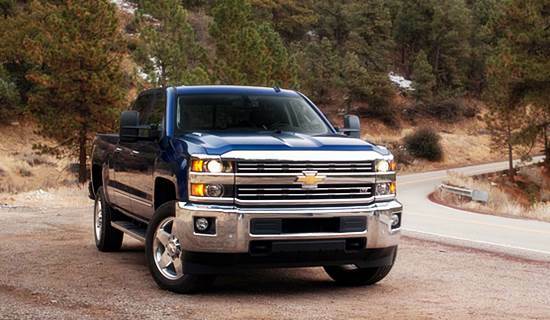 Equipped with a 455/370hp V-8, it can cruise all day in style. It even comes with the original 8-track player. 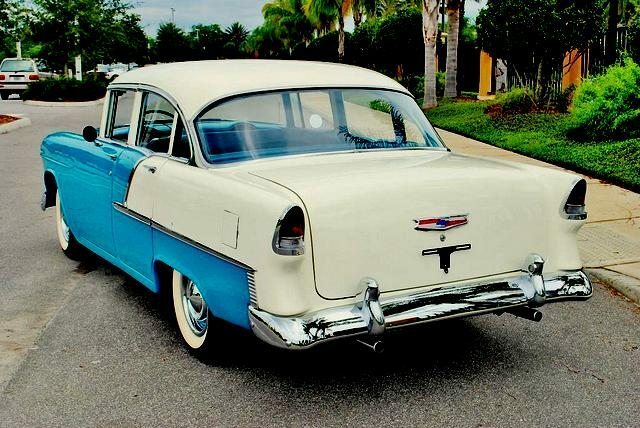 1955 Chevrolet Bel Air 210 – $10,156. 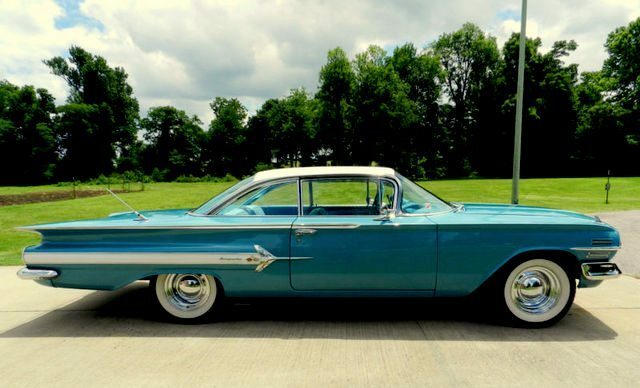 This stunningly restored Chevy is a perfect summer cruiser. It sports a 350cid V-8, dual exhaust and even an Alcantara “suede” interior. 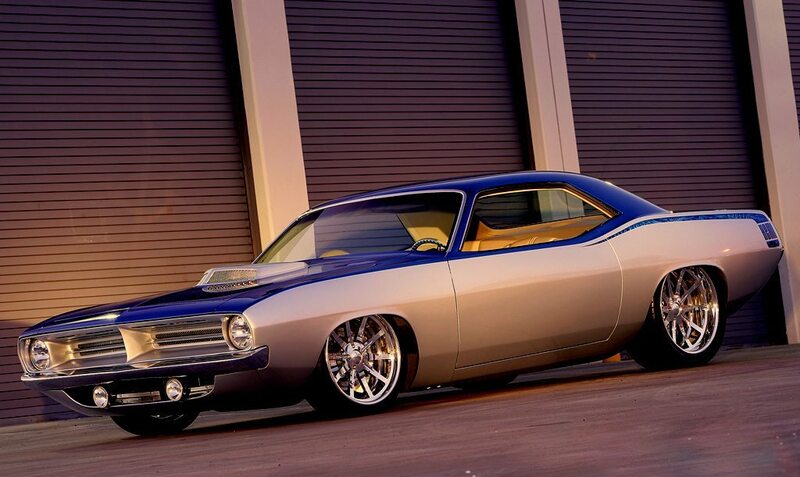 Formerly owned by Lloyd MacKay, NHRA racer and collector, this car was fully restored and has every power option. 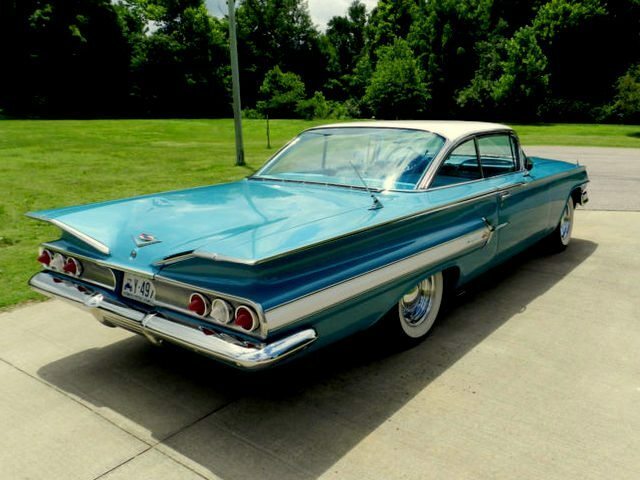 1960 Chevrolet Impala – $25,300. This Chevy is more subdued than the outrageous 1959 model, and sports aircraft inspired side trim, and subtle ‘bat wing” tail fins. With only 5,331 miles, this car is a truly amazing example. It has the perfect color combination for the ultimate summer cruising car. 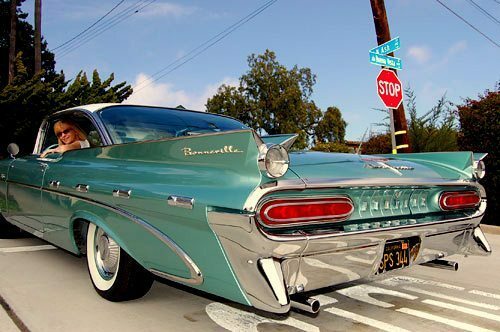 1959 Pontiac Bonneville – $15,000. Nothing says summer like a teal and white Pontiac. This car was the King of the Hill at Pontiac, and was built at the height of the golden age for cars. The Bonneville sports a 389 tri-power V-8, a wide track design and Pontiac’s new gyro level ride suspension, giving it the best handling performance of any 1959 full size car. 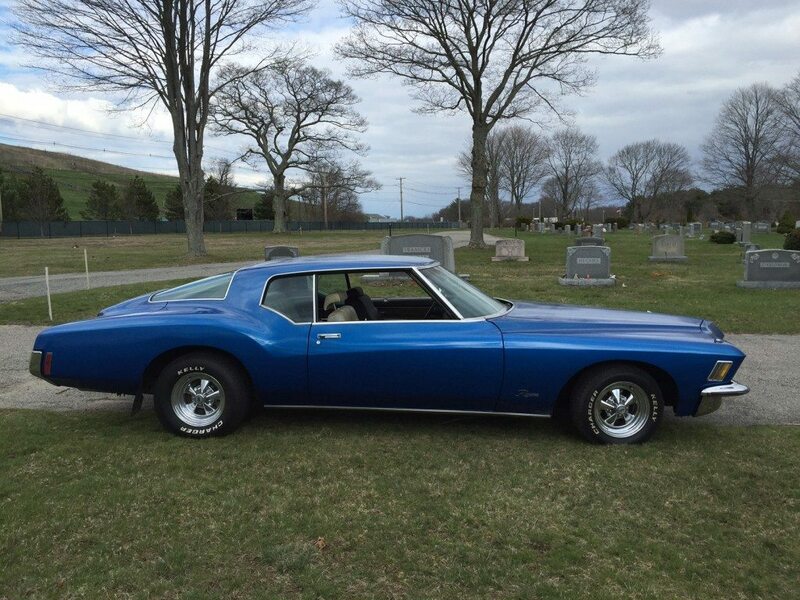 1972 Pontiac Catalina – $18,100. One more from Lakeland Florida, this car has only 30,296 miles and sports a 400ci V-8. 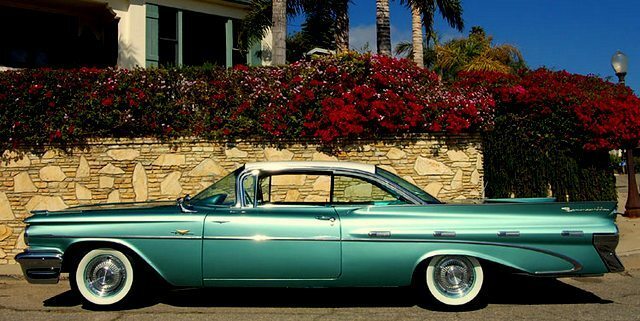 This is an absolutely gorgeous example of a perfect summertime cruiser. 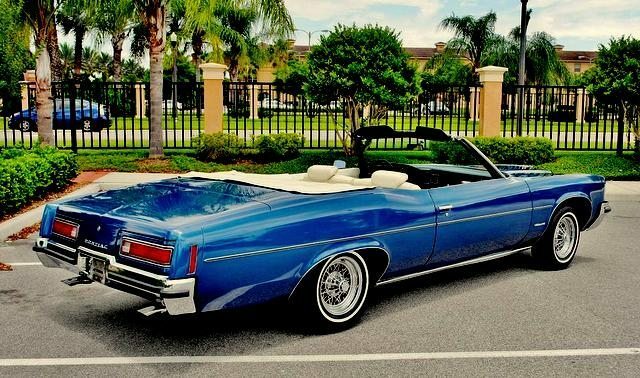 With a perfect interior, and the colors of a perfect blue sky, this car would be great for a nighttime top-down cruise. 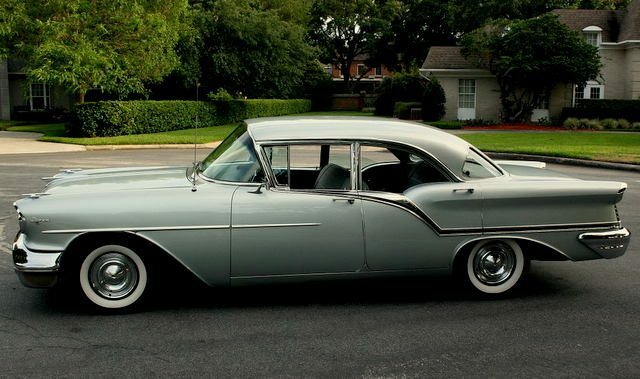 1957 Oldsmobile Super 88 – $12,000. Our friends in Lakeland Florida always find the best cars, and this one is astounding. 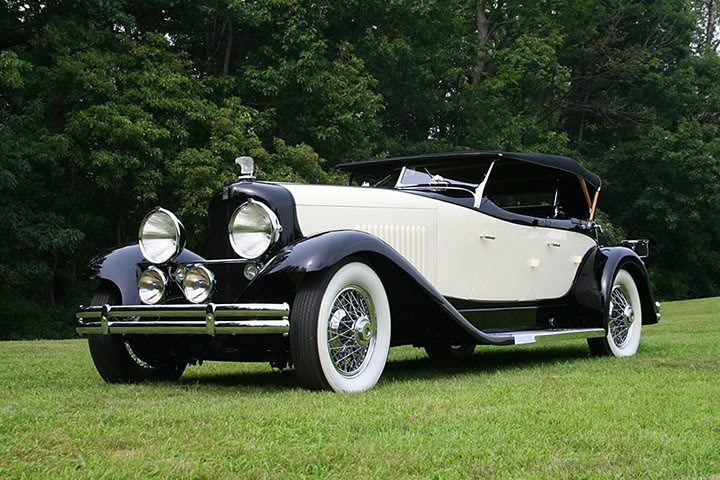 This Super 88 has only 28,000 miles, and is finished in a stunning Platinum Mist Poly Metallic, and sports a 371 Golden Rocket V-8. The car came from a New Jersey collection and is mostly all original. 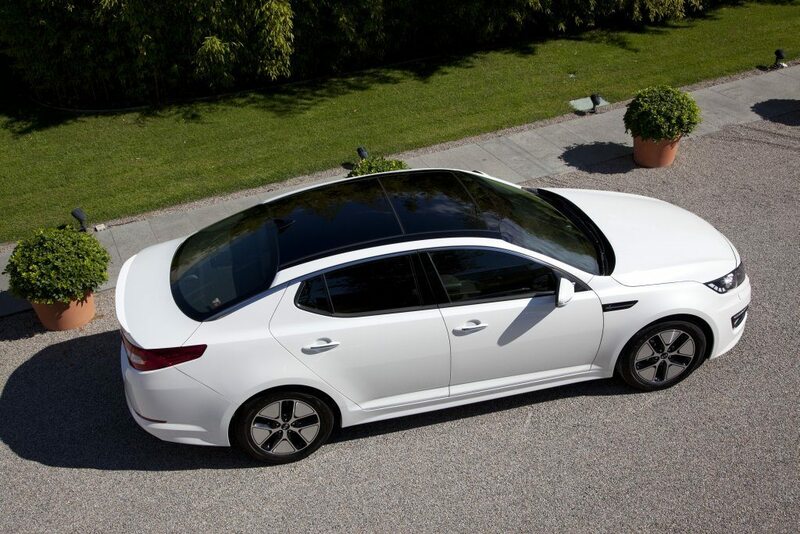 The tri-window roof treatment and the stunning chrome side rails make this car a real head turner. This is the perfect car to impress everyone at the local car show. 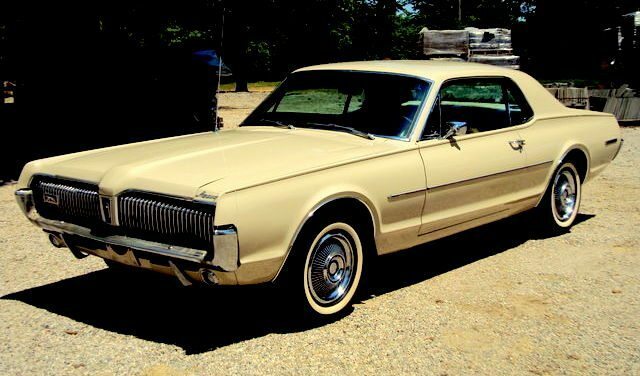 1967 Mercury Cougar – $8,600. 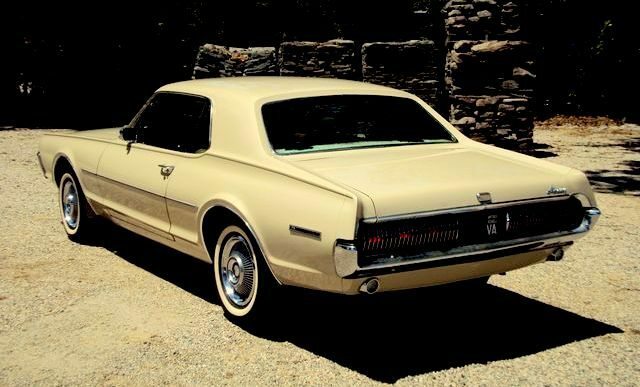 This is a truly elegant example of this pony car, finished in light beige with a medium saddle interior. Powered by a 289ci V-8 this Cougar is a solid, no-rust original car. 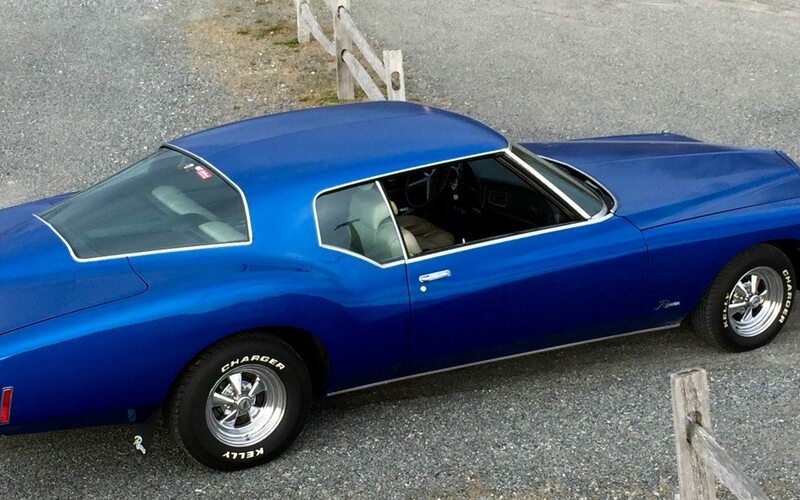 The color of this car highlights the cat-like styling making it one of the prettiest examples available today. 1956 Lincoln Premier – $15,500. 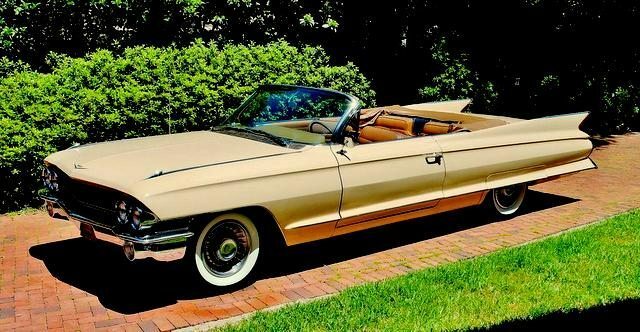 This is a magnificent automobile, and is selling for much lower than market due to the fact that it is a faux convertible. This Premier started life as a coupe, and lost its roof during a major redesign, including major body reinforcement. Finished in a non-original Pearlescent White with a luxurious red leather interior, the effect is stunning. 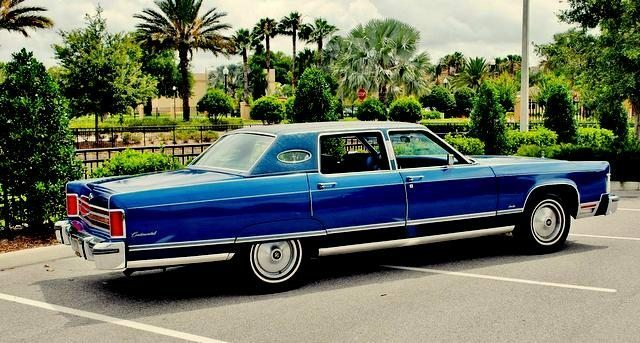 1976 Lincoln Continental Town Car – $5,100. Think of this as buying a huge summer mega-yacht for the price of a runabout. 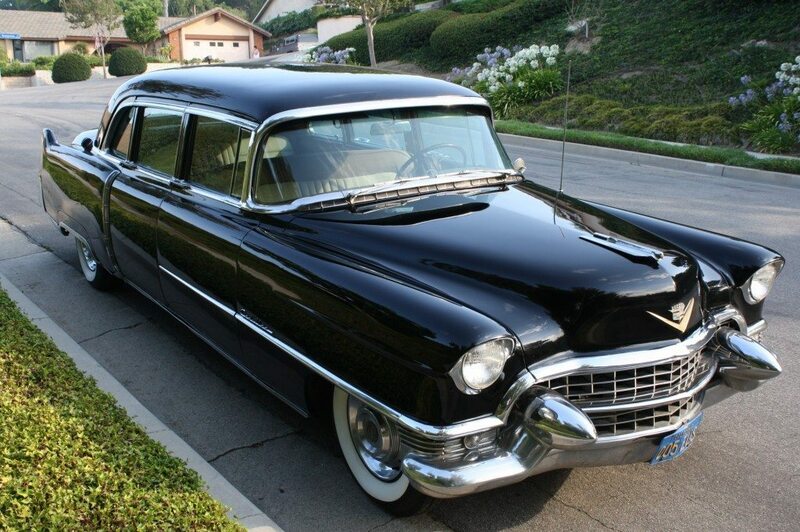 This beautiful Town Car has only 59,517 miles and sports a 460ci V-8 engine. Though not as light and airy as a convertible, it still is an excellent car for long summer drives. 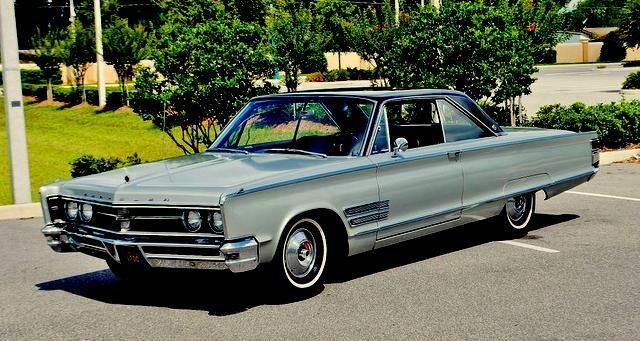 1966 Chrysler 300 – $7,800. 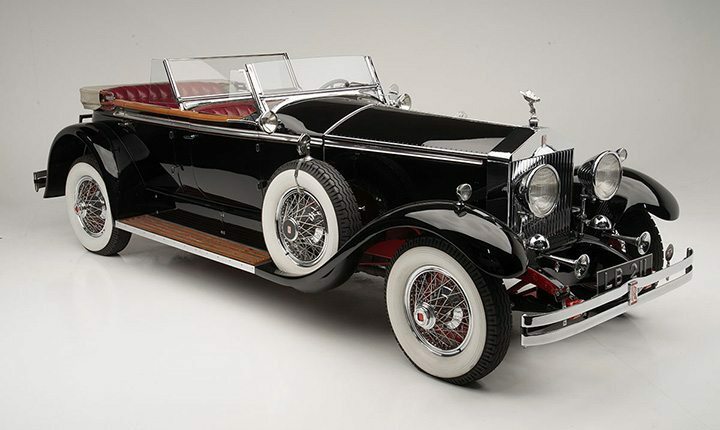 This car is an amazing example of a great Elwood Engel design. The car is -presented in a special order two-tone paint of black over dolphin gray with a black leather interior, the overall effect is dramatic. The car has 80,300 miles and sports a 383cid V-8, and is mostly original. 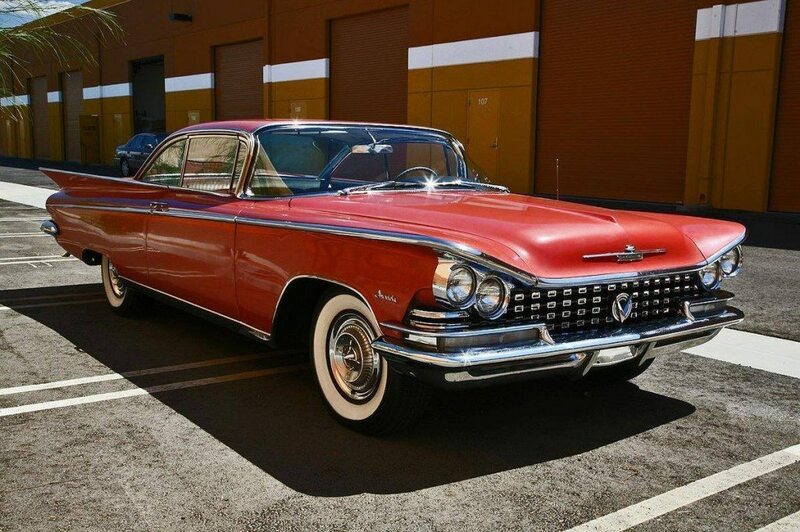 The paint and condition make this 300 a beautiful example of 1960’s styling. 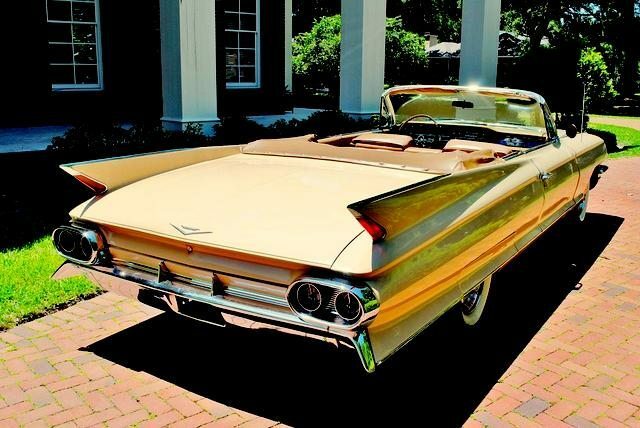 1961 Cadillac DeVille Convertible – $20,987. 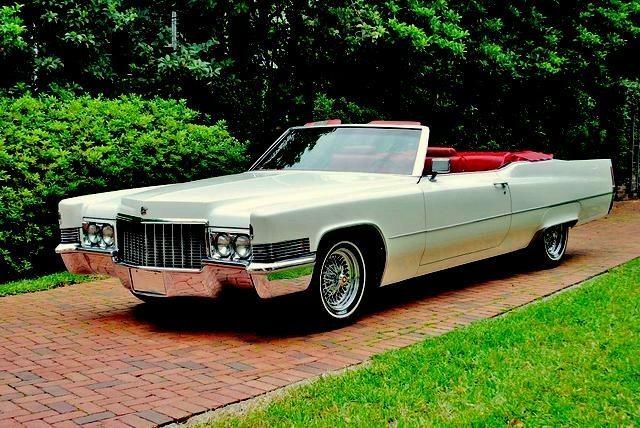 For the ultimate summer land yacht, nothing beats a Cadillac. This spectacular example is finished in Laredo Tan with saddle interior, matching saddle top and comes complete with Coker wide whitewalls and factory correct turbine wheels. If you want to turn heads when you are taking that sunset cruise, this is the car for you. That is my list of some great cruising cars for summer. 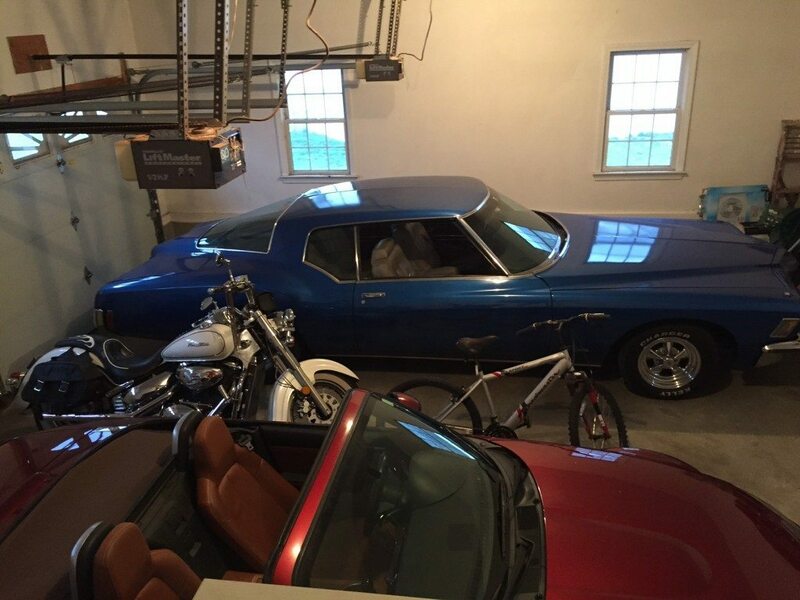 Let me know what car makes your list and let me know your memories of the perfect summer drive. Our first new product review for Chris on Cars comes from a company called BooEnn. 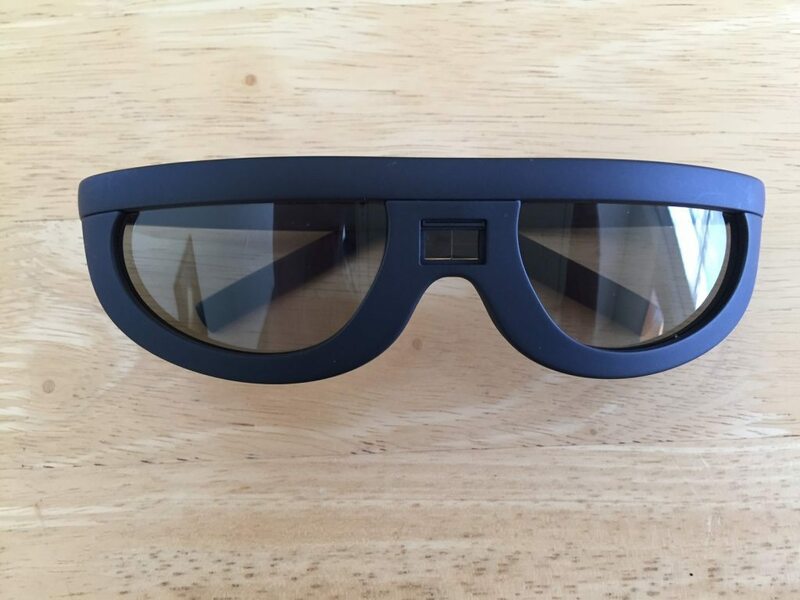 The product is a set of smart driving glasses with “anti-collision” lenses that change instantly depending on light. Powered by a low power consumption solar battery mounted right above the nose, they act to brighten or darken the lenses, depending on conditions. For a start, the idea is pretty standard. Many sunglass companies over the years have offered lenses that change with the lighting conditions. The major difference here is that these lenses are made from a patented flexible LCD material, and the transition is amazingly fast. Packaging – The box is similar to an iPhone, but lime green in color. 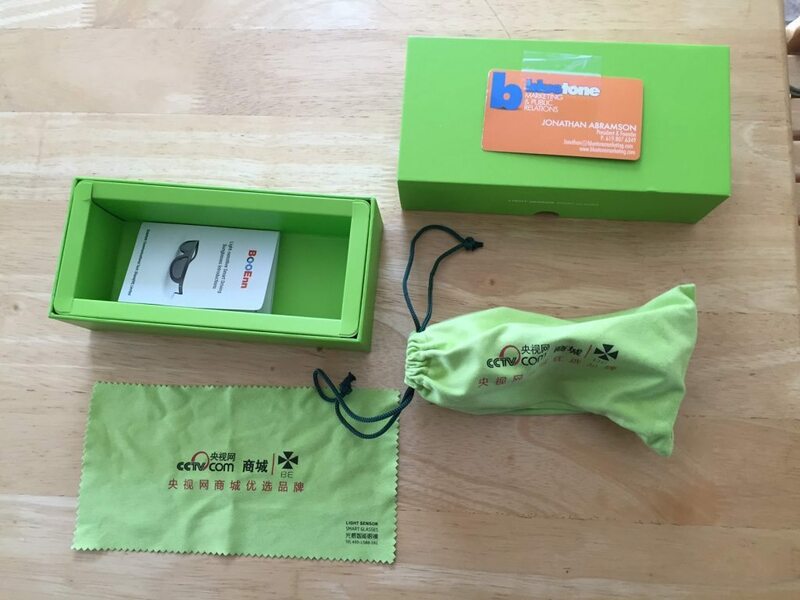 The packaging includes a lime green cleaning cloth, a matching pouch to hold the glasses, and company literature that is badly translated from its original language. The packaging is in line with the expected price point for the glasses, and has an expensive feel. Specifications – The sunglasses are made from something called Ultra-light Antiskid TR100, according to the company literature, a “light weight, collision-resistant, high temperature-resistant material with no chemical residue release”, which is in line with European requirements for food grade material. I’m not sure what that means, but it could be soy based or some sort of “green” material. The lenses are a flexible LCD material made from 13 layers of nano-materials, all designed to improve visibility. Design – The frame design is bulky, and not very attractive. The glasses are large and wide, and tend to sit high on your face due to the molded nose pads. When worn, the glasses tend to be large on the face and stick out at least a quarter inch on each side of my head. Overall, the look is something between Buddy Holly and Giordi from Star Trek. When folded, the glasses do not fold flat, so pocketing them is out of the question. 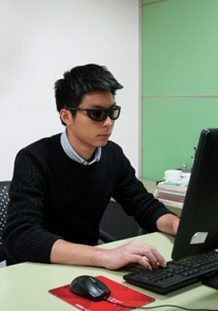 Functionality – The glasses function well and work as described. The darkening effect from shade to sunlight is amazingly quick, and visibility is definitely improved with the glasses. Even in conditions that require the lenses to change continually, the transitions are quick and not distracting. Overall – While the design of the frame needs work, the technology is so good that I would buy a pair myself. After checking with friends, most decided they would tolerate the terrible design of the frame to have the technology. 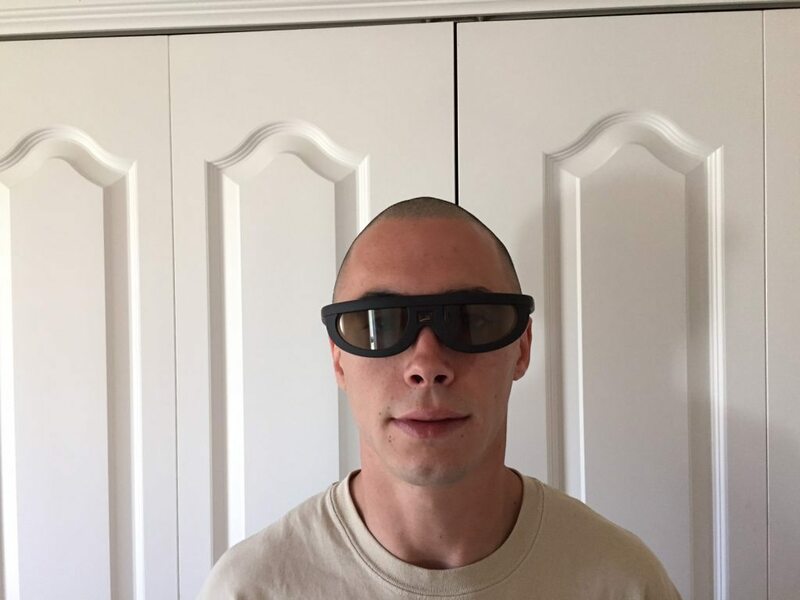 BooEnn has not announced a specific price for the glasses, but I was told they are initiating an Indiegogo crowdfunding campaignwith prices ranging from $75-$150 depending on the perk. I am also told that the company plans to update its marketing literature to be more in line with US standards, and tweak the design to be more fashion conscious. Rating – On a scale of 1-5, I would rate these a 3, with the caveat that if BooEnn tweaks the frame design to be more fashionable, they would be a 5. 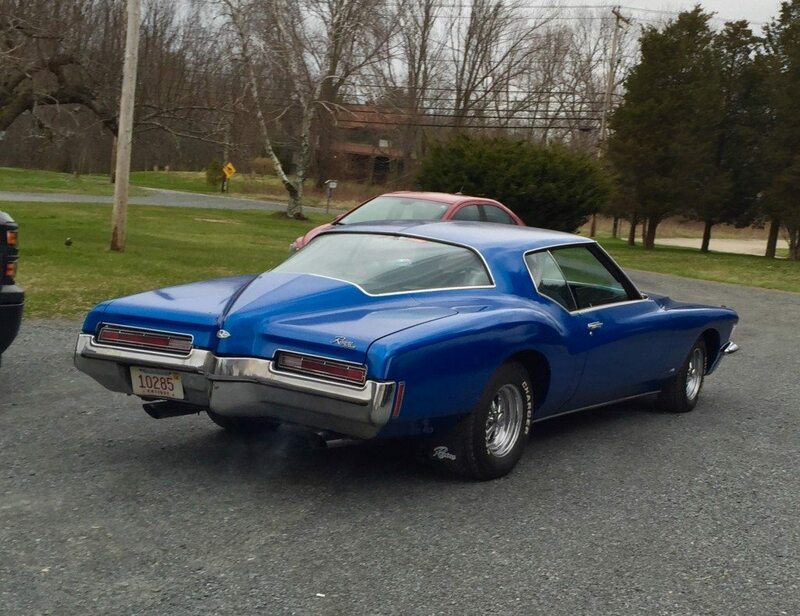 Those of you who have followed my site know that I joined a website called Car Lister.co a while back to connect with my car-enthusiast friends and to post my content. Car Lister is a new website that promises to be an all-in-one consumer car buying solution. Utilizing technology, Car Lister simplifies the transaction of a vehicle between two parties in the online world in a way that’s never been done before. Car Lister has solved the problem of selling a car online, with a fully integrated, automated process that incorporates real time notifications and full validation throughout the entire process. The system allows buyers to shop for new and pre-owned cars from any smartphone, tablet or desktop. What I like most about Car Lister is that it’s like Facebook for gear heads. I can connect with my friends, talk about my rides, or post and read articles about the stuff I am interested in. Users can even form groups, trade pics, and network with people from all over the world. 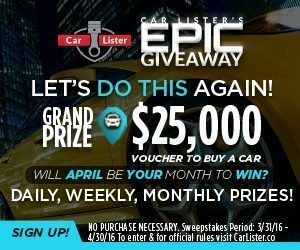 To celebrate the launch of their new website, Car Lister is introducing the 2016 Car Lister’s EPIC Giveaway.They are giving away daily,weekly,and monthly prizes. The grand prize will be a $25,000.00 voucher to purchase a vehicle at one of their participating Car Lister dealerships every month! 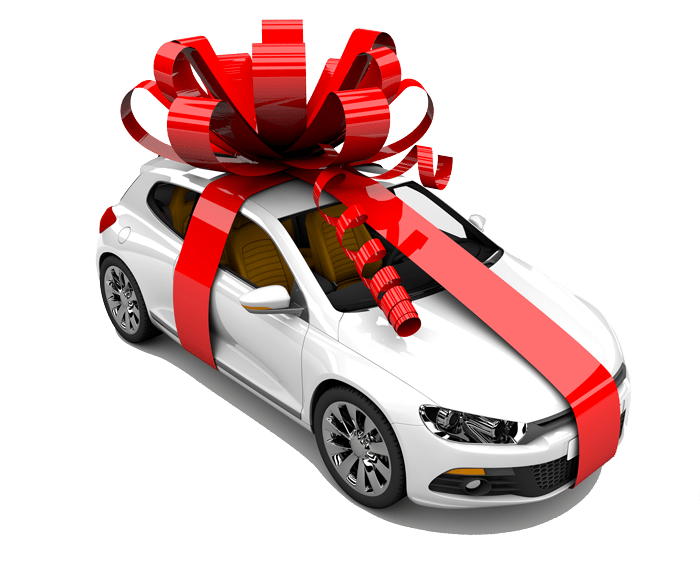 Daily prizes include gas cards and oil changes, weekly prizes include new tires, jumper box, and vehicle detailing and the monthly prizes are a $500.00 service voucher and the previously mentioned voucher for a car. With everything that they are giving away, Car Lister also have a weekly contest that is called You Share, We Repair. If you share your story with Car Lister, you will be entered to win up to $3,000.00 towards vehicle repairs at a participating Car Lister dealership. Restrictions are listed on the rules page on their website. 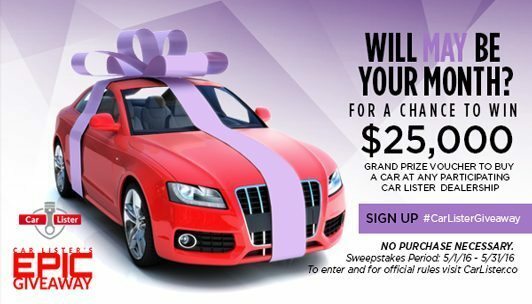 Just sign up for a free Car Lister.co account and click on sweepstakes then click “enter to win” and you will have access to daily,weekly and monthly giveaways. Check out the “Winner’s Circle,” and you will see that there have already been 118 winners from 37 states, winning prizes ranging from gas cards all the way up to the lucky February “Grand Prize” winner who won a $25,000 voucher to buy the car of their choice.The best part about this giveaway is that it’s just the beginning. The entries have reset as we enter March, and I am crossing my fingers that this could be my (or your) month to win! 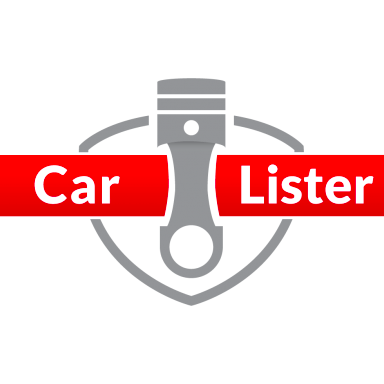 Joining Car Lister is a great way to network with people who love cars, and a great way to make friends. 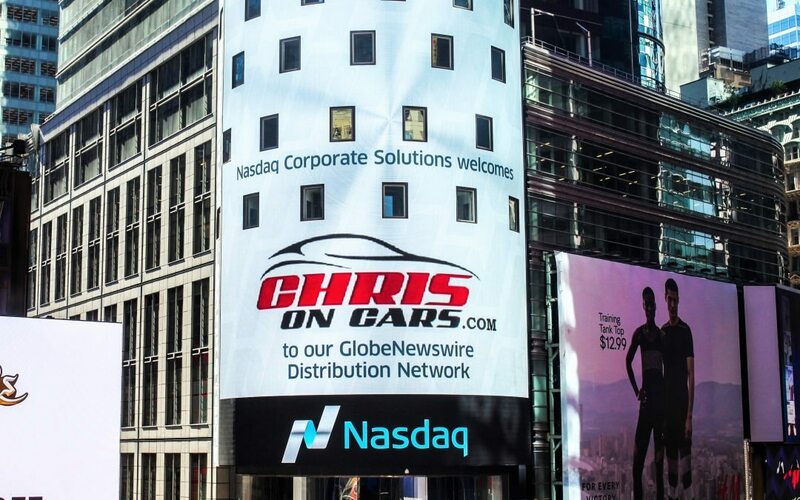 Once you join, check out the Chris On Cars page for articles, comments and discussions on the latest cars…don’t forget to join my group and connect with me.